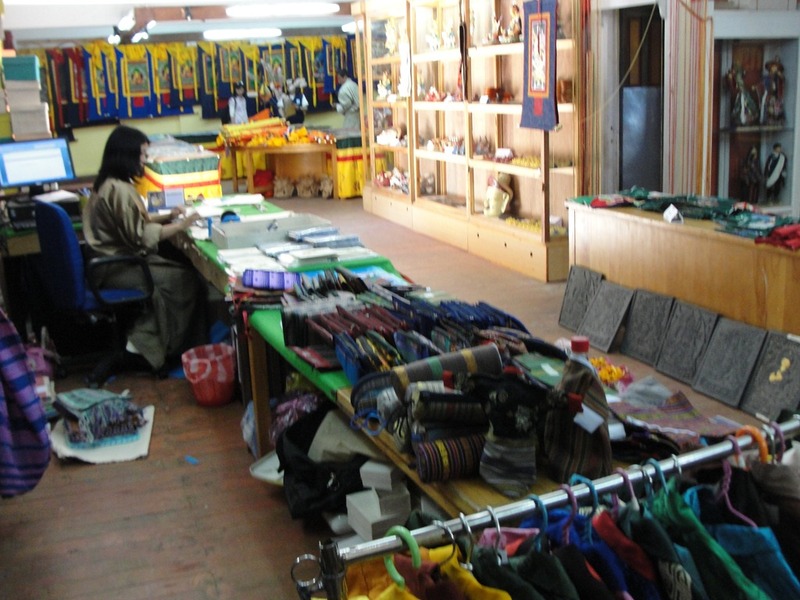 We will spend most of this day touring places involved with traditional Bhutanese arts and crafts. 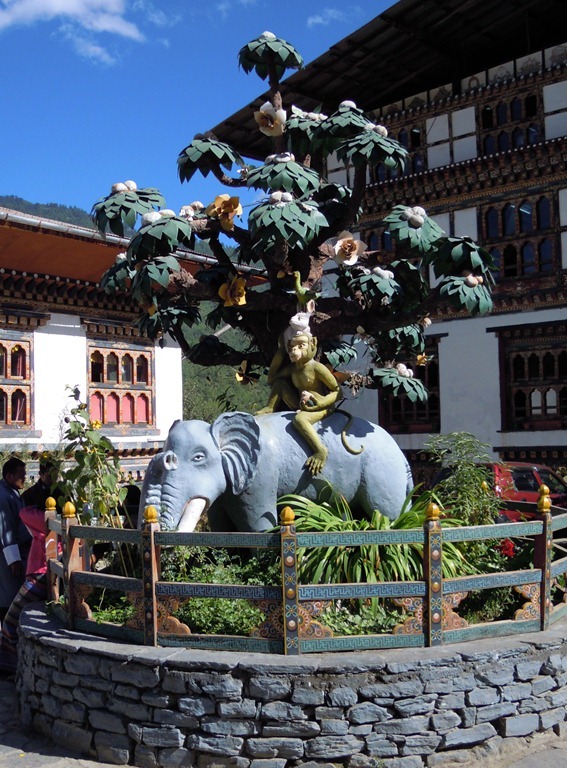 The first day is shown in this post: Bhutan: Paro and Thimphu. 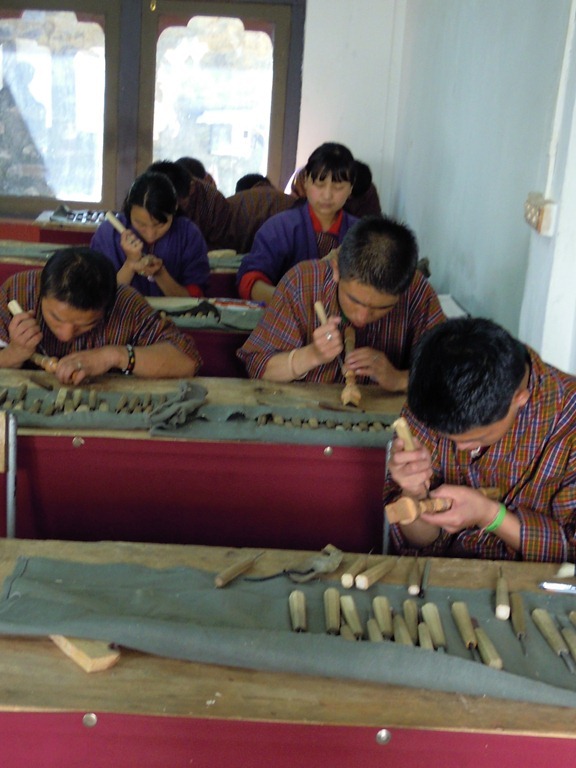 In Bhutan, the traditional arts are known as zorig chusum, “the thirteen arts and crafts.” These practices have been developed through the centuries, often passed down through generations of families with long tradition of a particular craft. 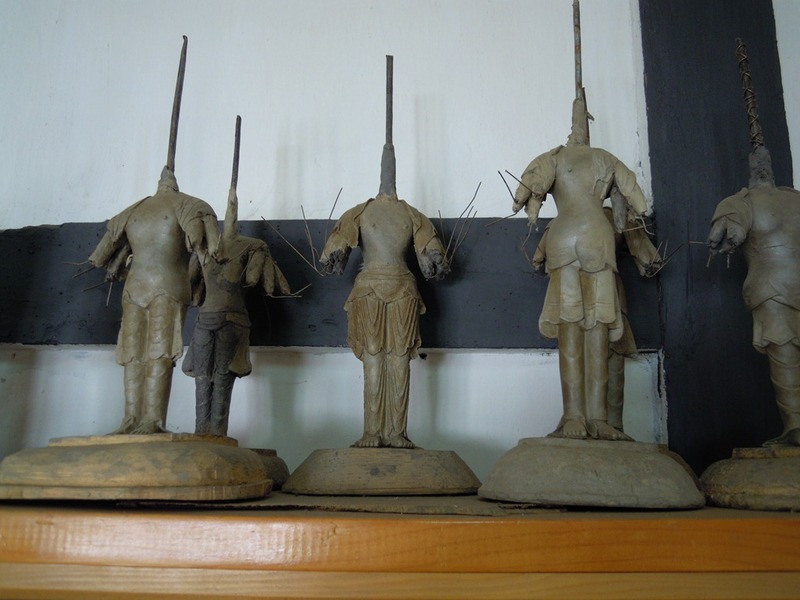 To preserve these, the King has started a special school, The National Institute of Zorig Chusum, which we will visit today after a tour of the handmade paper factory. 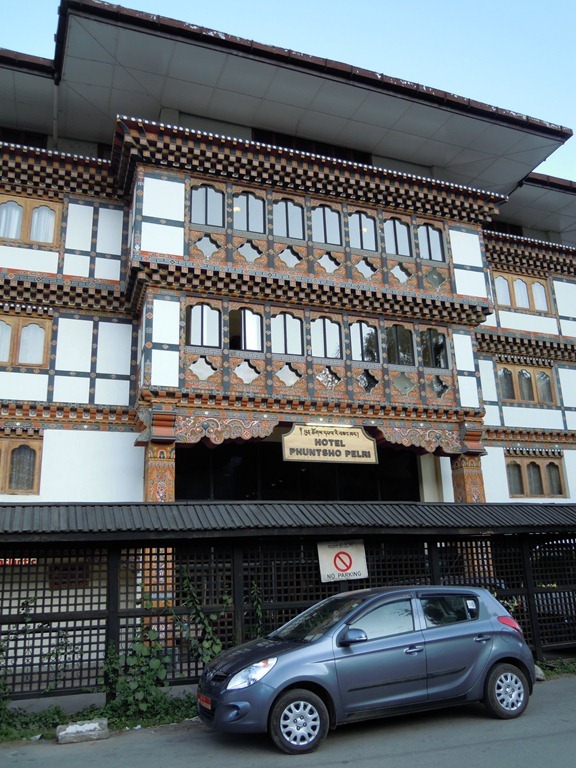 We will also visit the seat of government in Bhutan, the Tashichhoe Dzong. 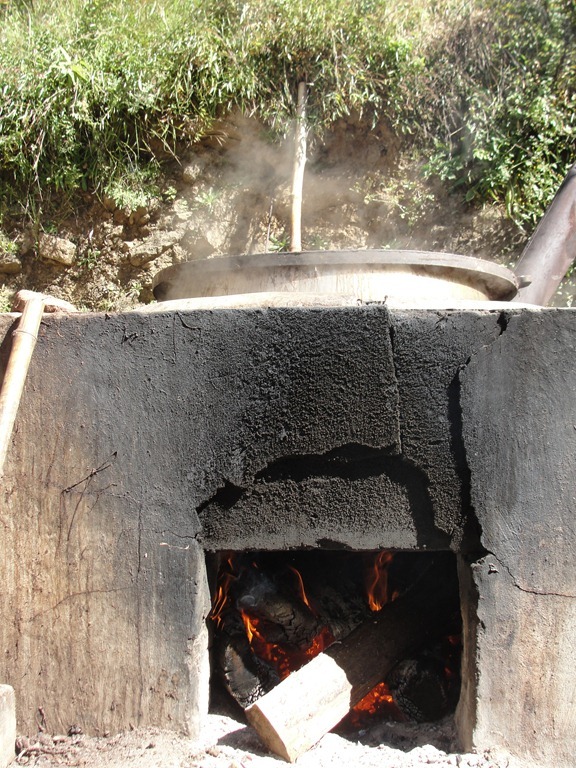 Handmade paper known as deysho (or Dezo) is one of the zorig chusum, and is still in popular usage today in Bhutan. 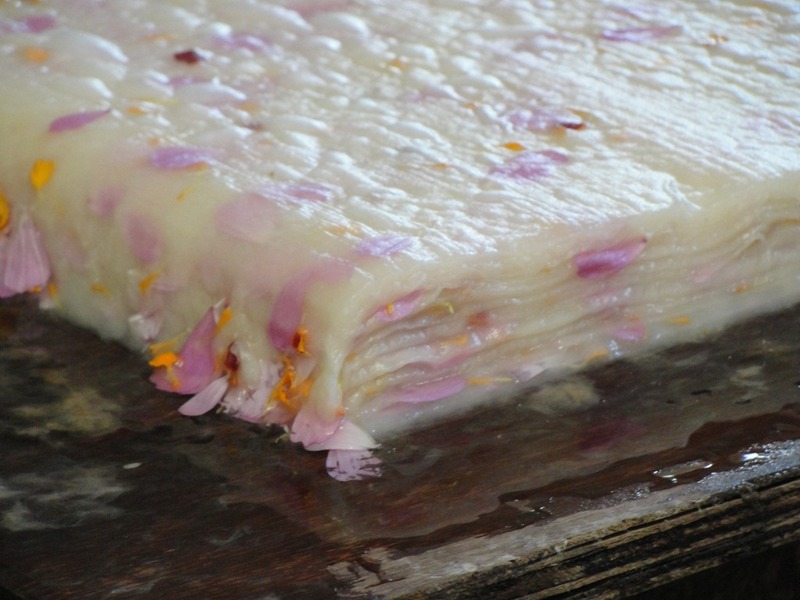 The basic material used is the bark of the Daphne plant. It is durable and insect-resistant. 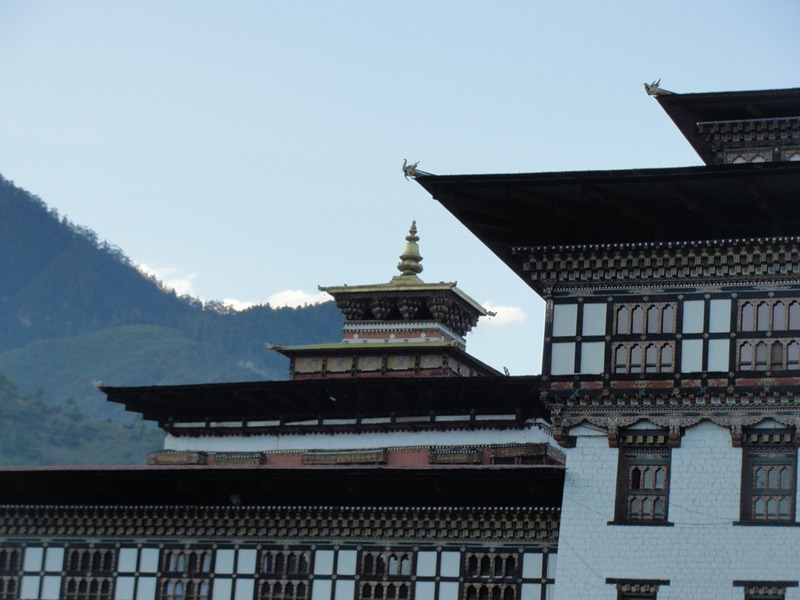 Historically, paper was made in Bhutan to provide Buddhist monasteries with paper for woodblock and manuscript books, and for writing prayers and mantras. It is also used for packaging gifts. 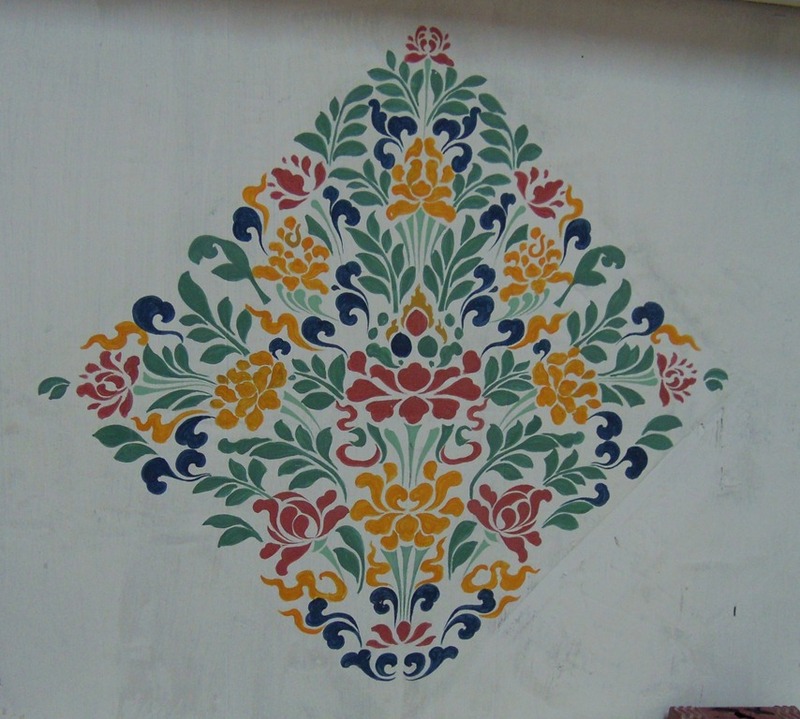 Apart from handmade paper, paper factories in Bhutan also produce ornamental art paper with designs of flower petals, and leaves, and other materials. 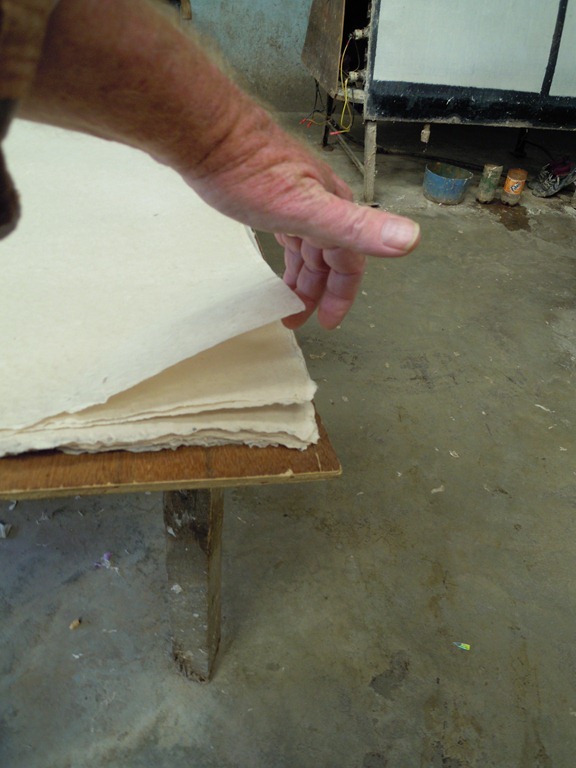 For use on special occasions, vegetable-dyed paper is also made. 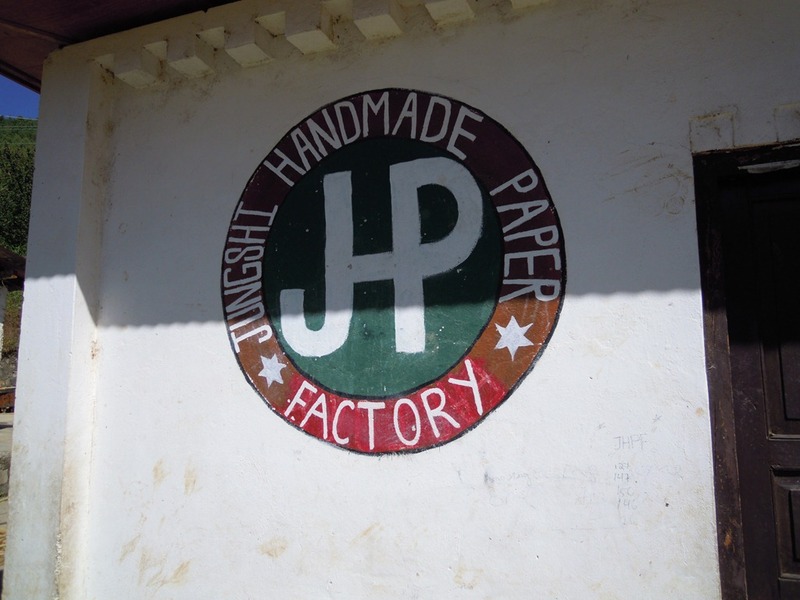 Our guide took us to a well known place, the Jungshi Handmade Paper Factory. Thanks to Wanderlust and Lipstick for the description of the process. 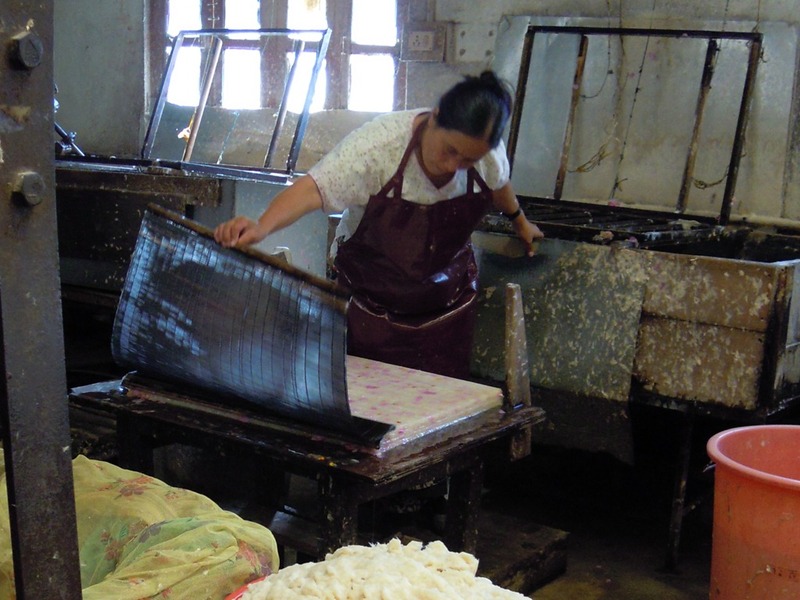 The word Jungshi means “natural.” Raw materials, supplied from bark from two trees, are used to make the paper. The Daphne Papyri grown at an attitude of 1500 feet and below produces a strong, dark paper. The Edgeworthia Papyri found at higher altitudes of 3000 feet and above, produces a whiter, more fragile paper. Nature provides other ingredients, like flowers, leaves, and fern fronds, which make decorations on the paper. 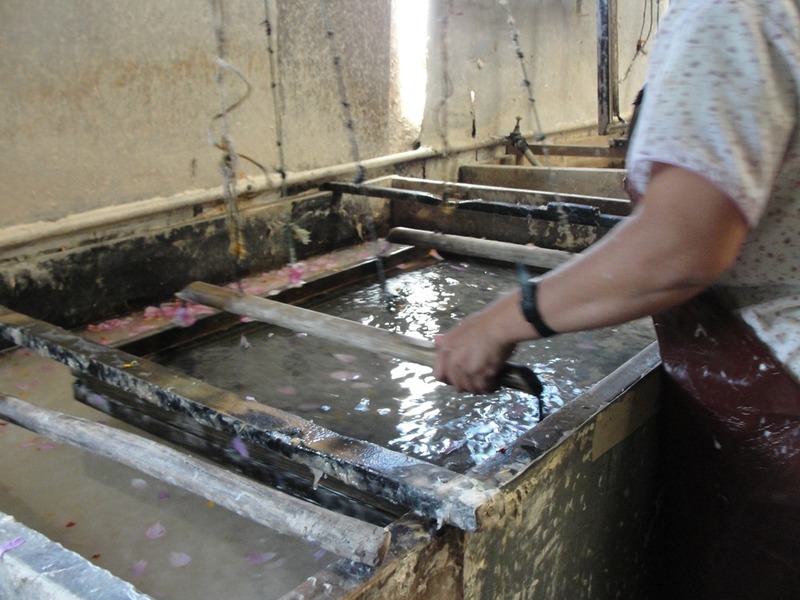 Paper making is done without any environmental harm to the land, and without the use of chemicals. 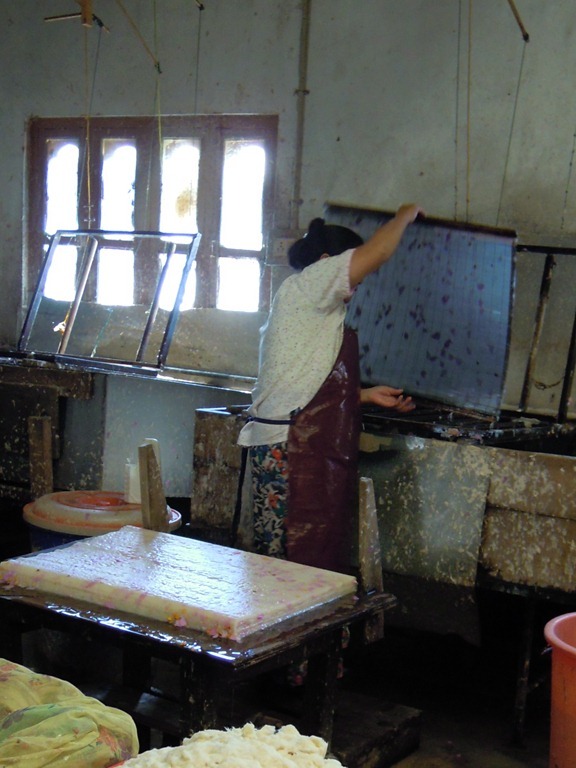 The entire process to produce one sheet of paper actually takes three days. 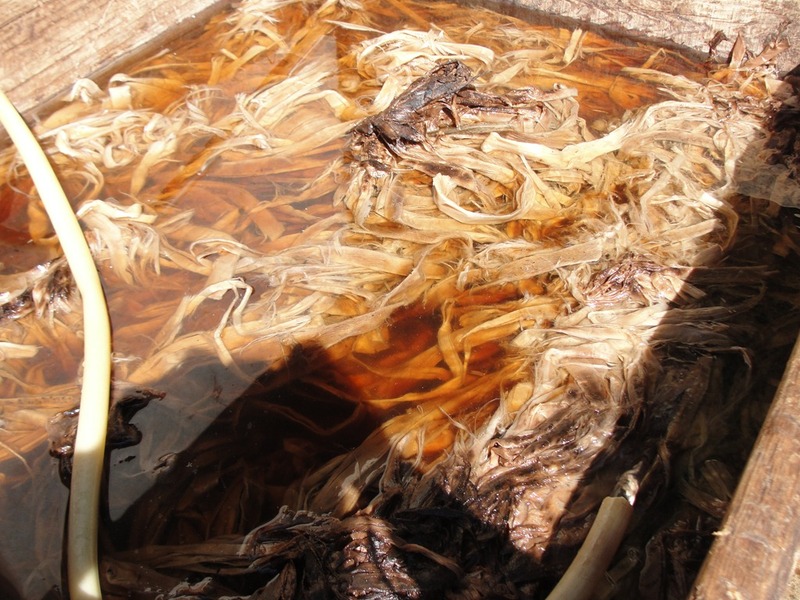 The process begins with pulling strips bark off the trees, and soaking them in water for 24 hours. Below, a shot of the starting material. 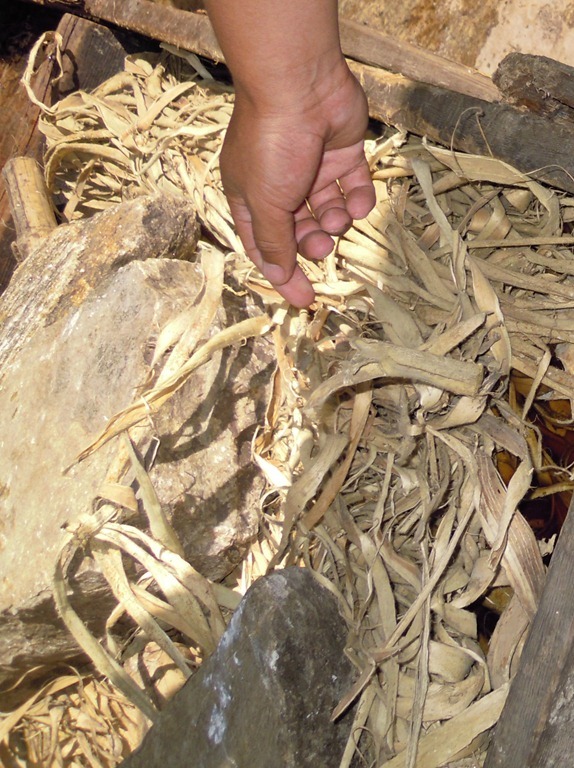 The bark is then boiled and washed, and further cleaned, separating good, fine fibers from bad fibers. 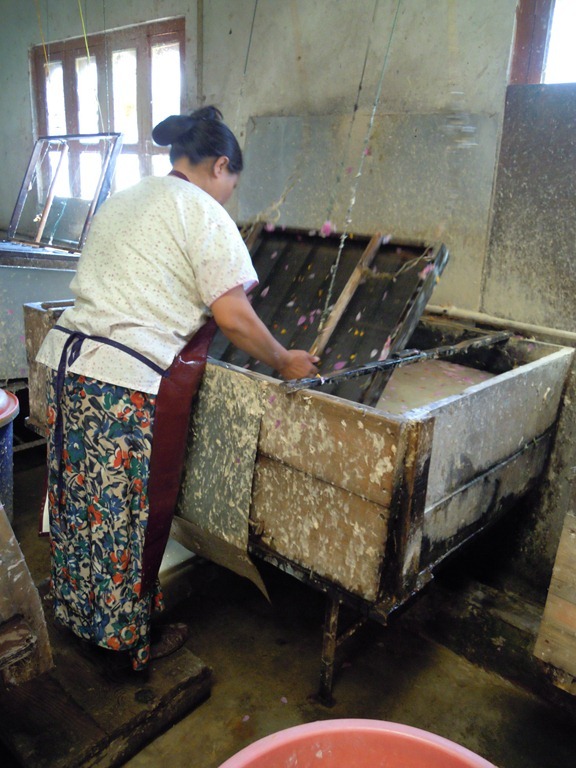 The fibers are crushed and pounded by a machine into a wood pulp, and then mixed by hand in a vat, with water and a vegetable starch made from the hibiscus plant root. 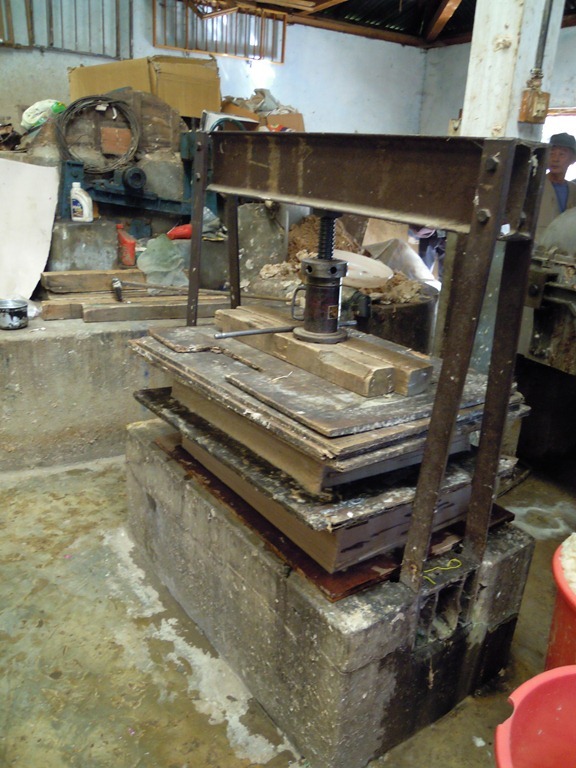 Machine for pounding the pulp. 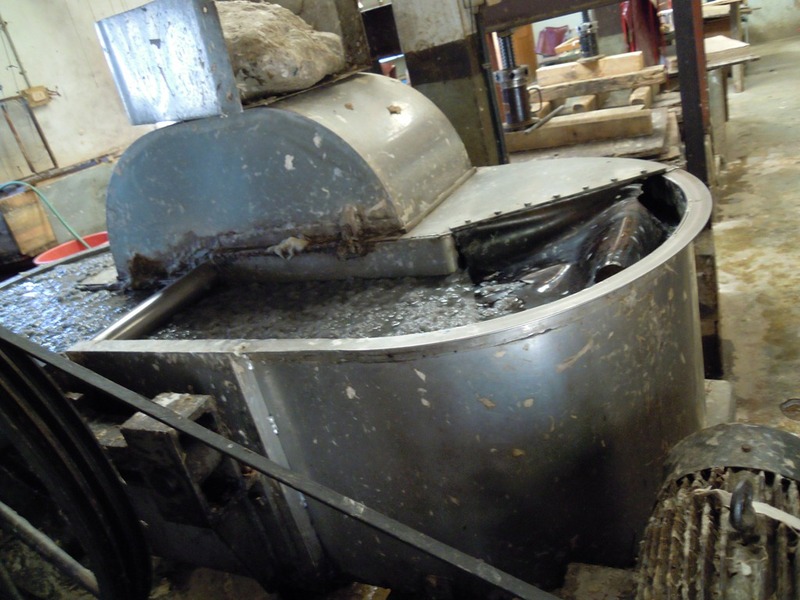 A wooden frame holding a screen filter, approximately two feet by three feet in size, is dipped into the vat of the pulp and starch mixture, and is swished around to allow a thin layer of the mixture to spread out evenly over the screen. 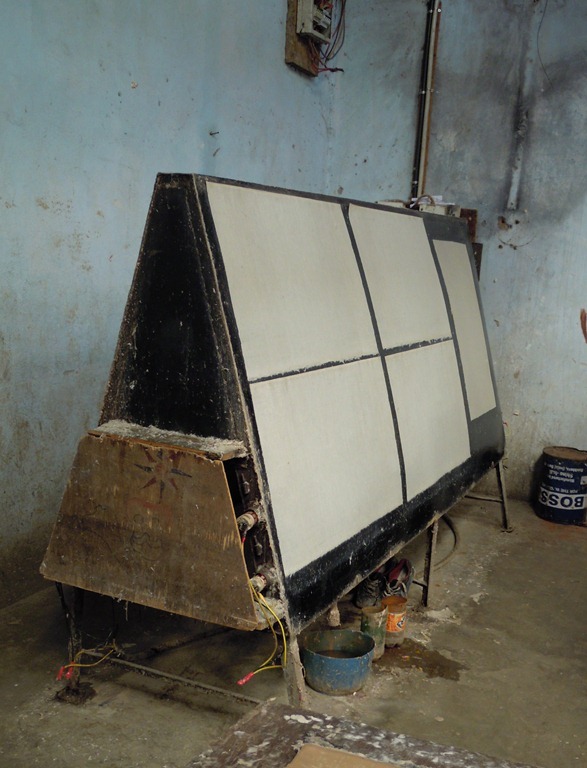 Carefully, the screen, now covered with a thin layer of the mixture, is removed from the wooden frame. …to a table where a stack of paper has already been started. The screen is laid on top of the stack, and then carefully removed, leaving a new sheet on top of previously made sheets of paper. This process is repeated over and over again, as many as 1500 times a day, by hand, creating a stack of paper, one sheet at a time. A whole stack of paper is then compressed to squeeze out any water. Each sheet of paper is taken off the stack, one by one, and is hung to dry on smooth vertical easel-type boards. 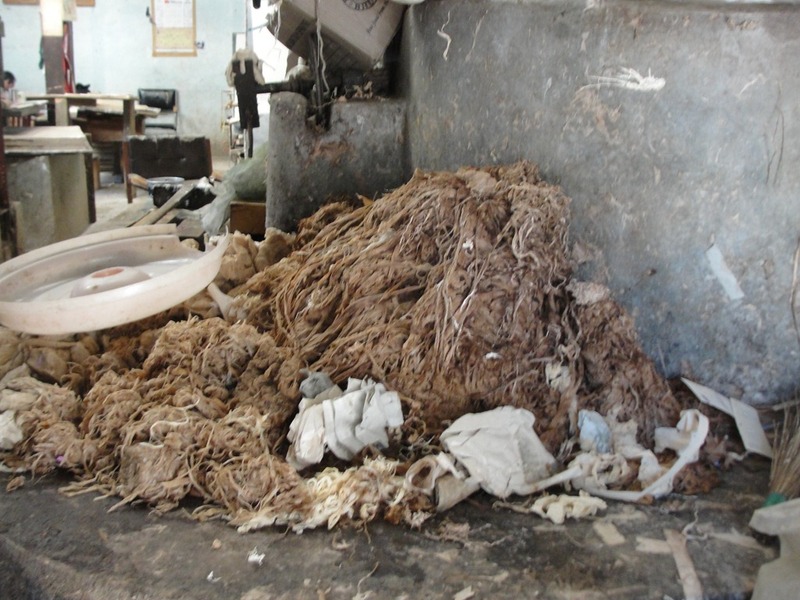 Finally, there is a sorting process of taking the best handmade paper and using that for products, and recycling the rejected paper. 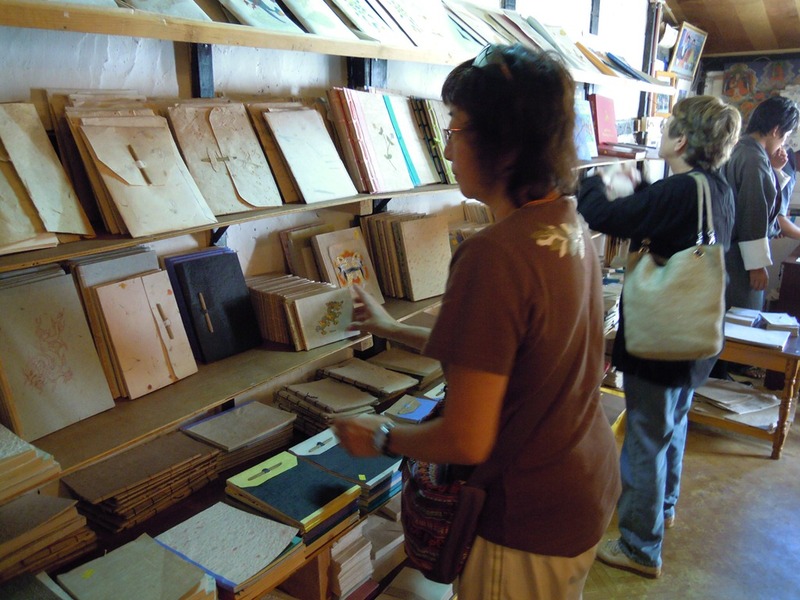 Paper and paper products include writing paper of different sizes and colors, photo albums, stationery, journals, greeting cards, envelopes, calendars, scrolls, wrapping paper, paper bags, and much more. 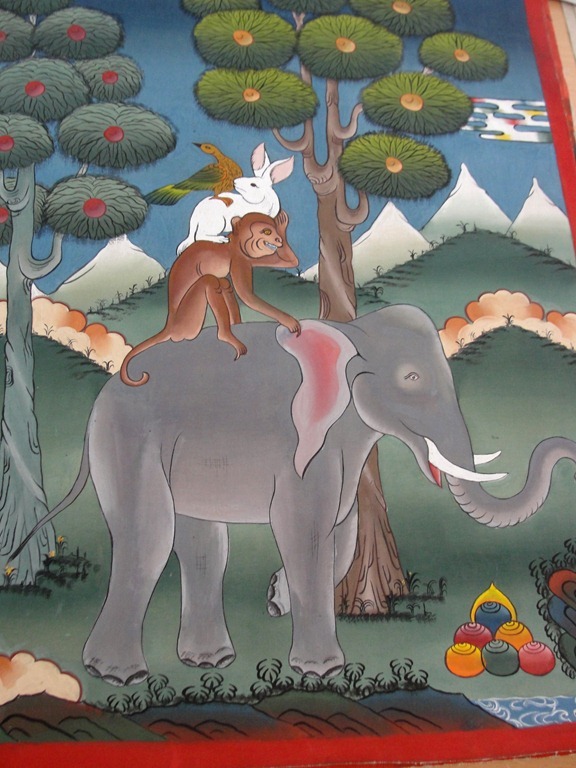 Greeting cards and scrolls may be decorated with flowers, hearts, and important Bhutanese symbols and places, such as the fable of the Four Friends, the Tiger’s Nest Monastery, black-necked cranes, and Buddhist representations. These are all sold in the company store. 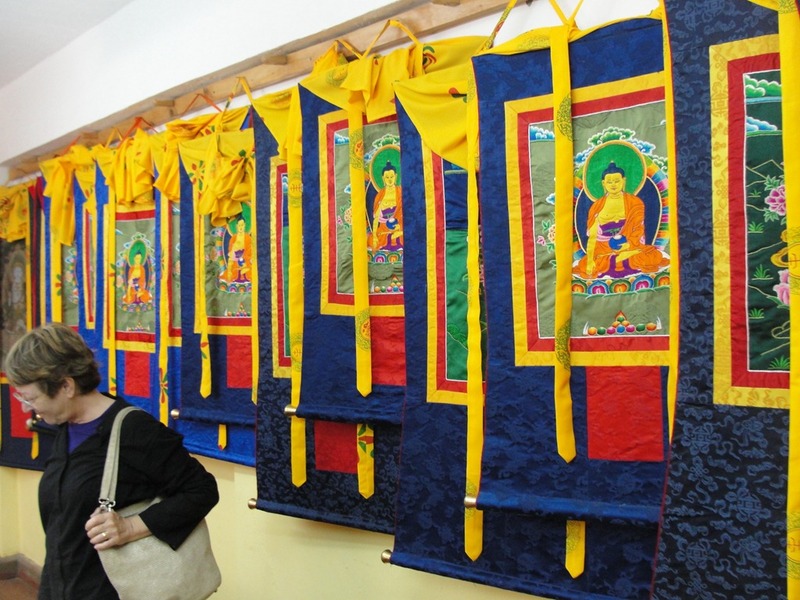 Next, we were taken to the National Institute of Zorig Chusum, where all of the 13 traditional arts and crafts are taught. 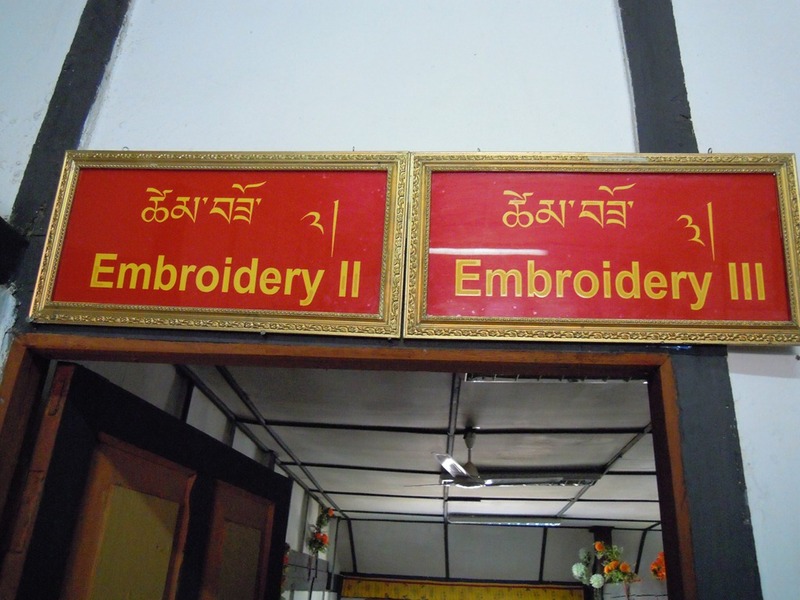 Specifically, the 13 traditional arts and crafts are: drawing and painting, sculpture, carving (wood, stone, and slate), calligraphy, paper-making, casting, tailoring (stitching clothes, embroidery and appliqué, and boot-making), weaving, carpentry, masonry, bamboo and cane weaving, gold- and silversmithing, and blacksmithing. 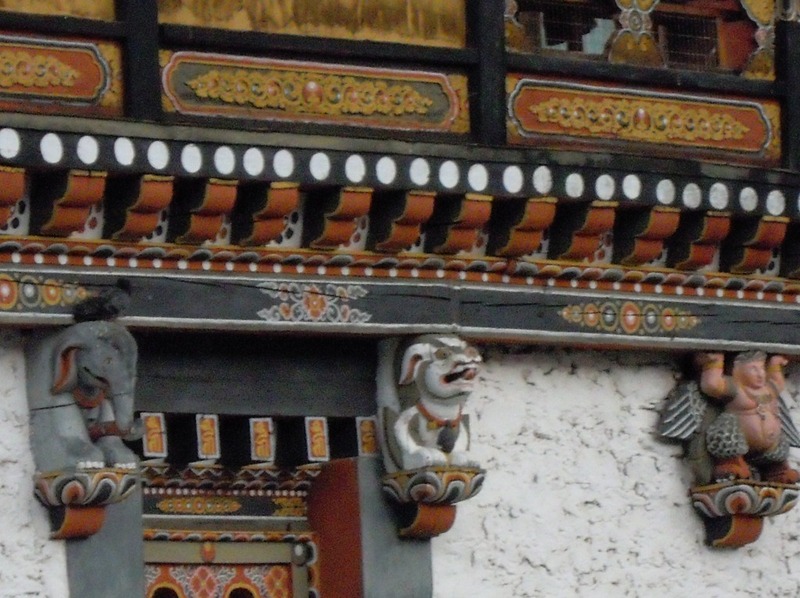 The 13 traditional arts and crafts of Bhutan are deeply rooted in Buddhism. Thus there is much significance to all that I was seeing. 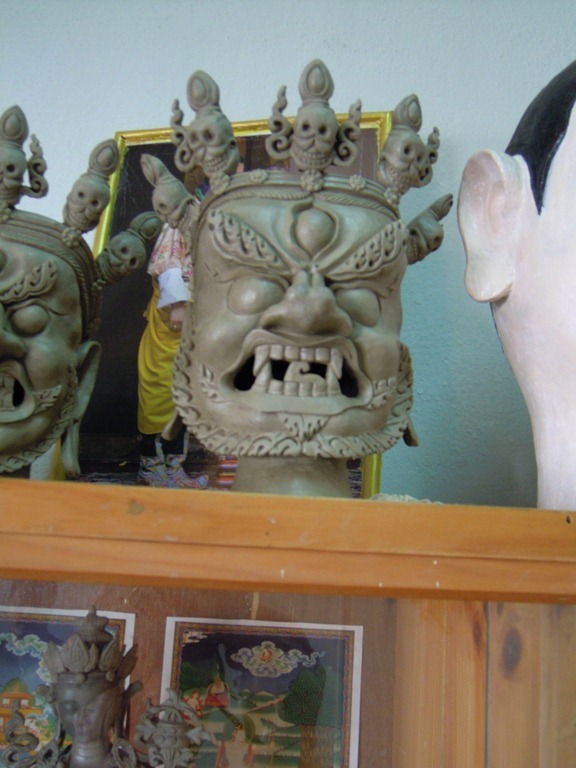 Many of the arts and crafts produce ritual items like the masks worn in religious festivals, or symbolic items placed on altars in temples, or the murals and frescoes inside temples and monasteries that tell stories of Buddha and other important religious figures. Thanks to Wanderlust and Lipstick for some of the information about this school. At the entrance is a large sculpture of The Four Friends. 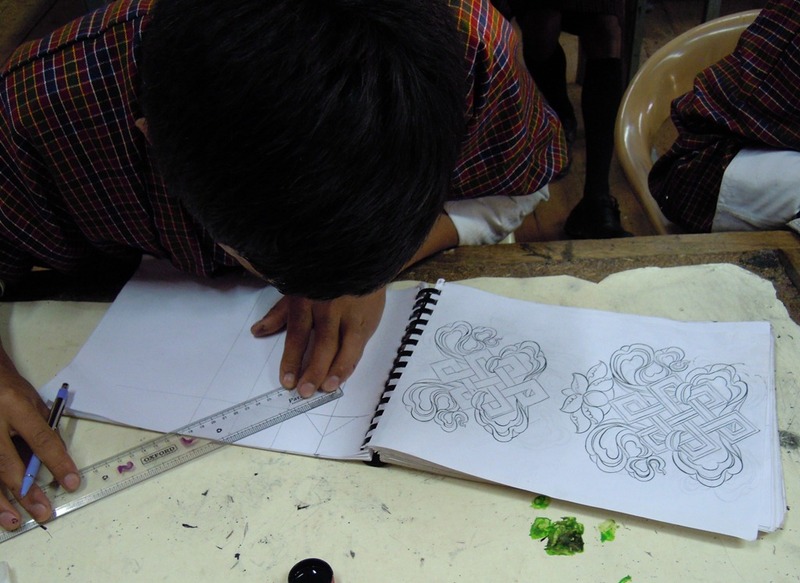 Today we will see wood carving, painting, sculpture, and tailoring. 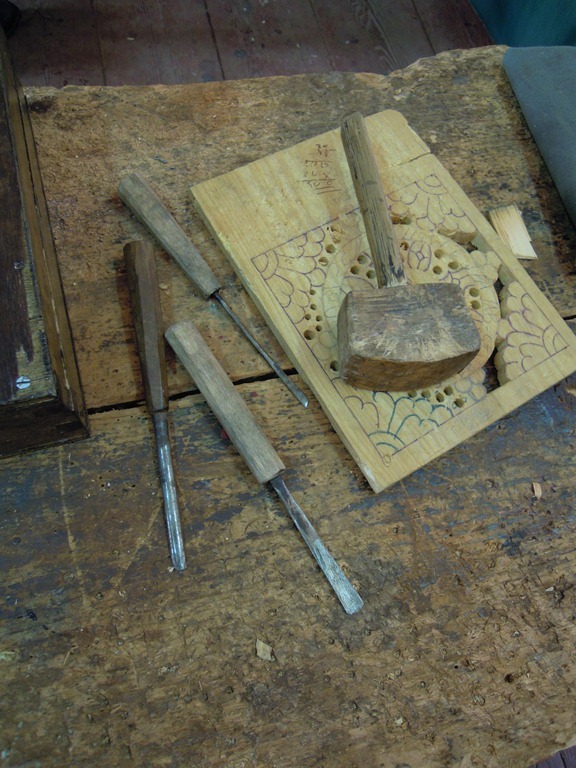 Each craft is taught in several levels of difficulty. 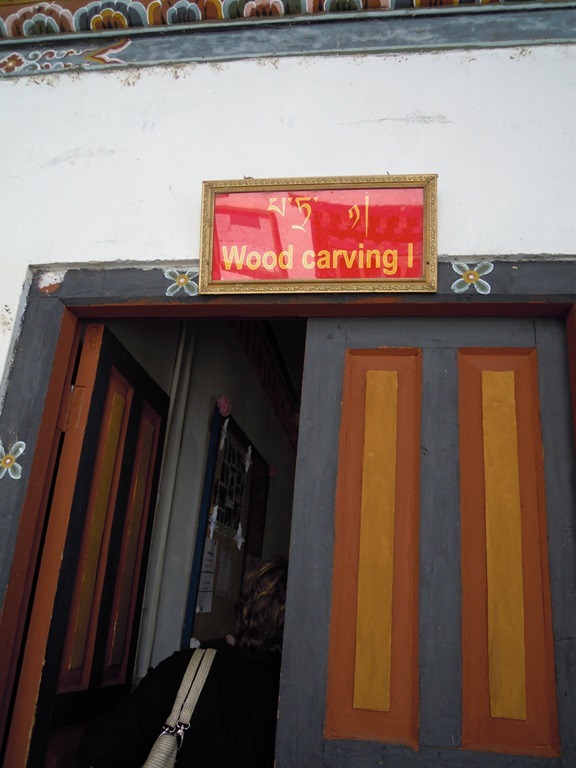 First we enter the beginning level of wood carving. 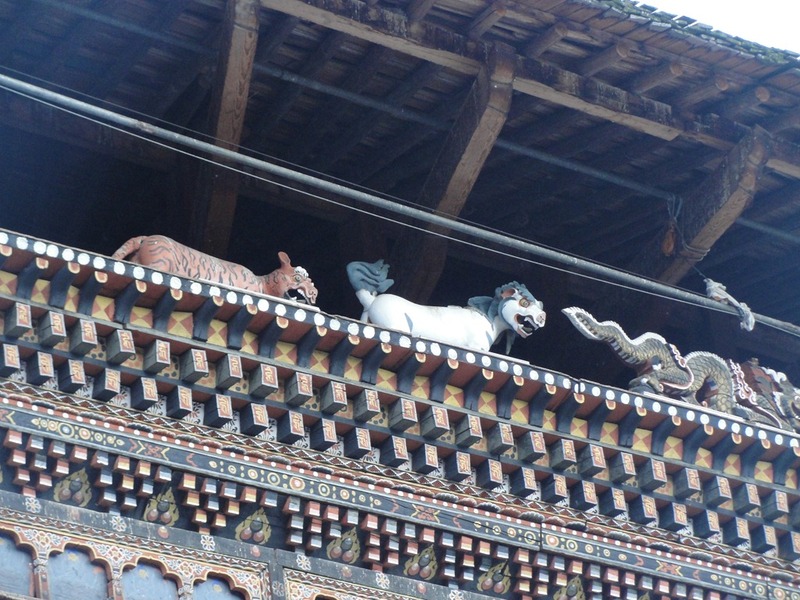 Wood carving is a specialized and ancient art form, which is significantly blended with modern buildings in contemporary Bhutan. 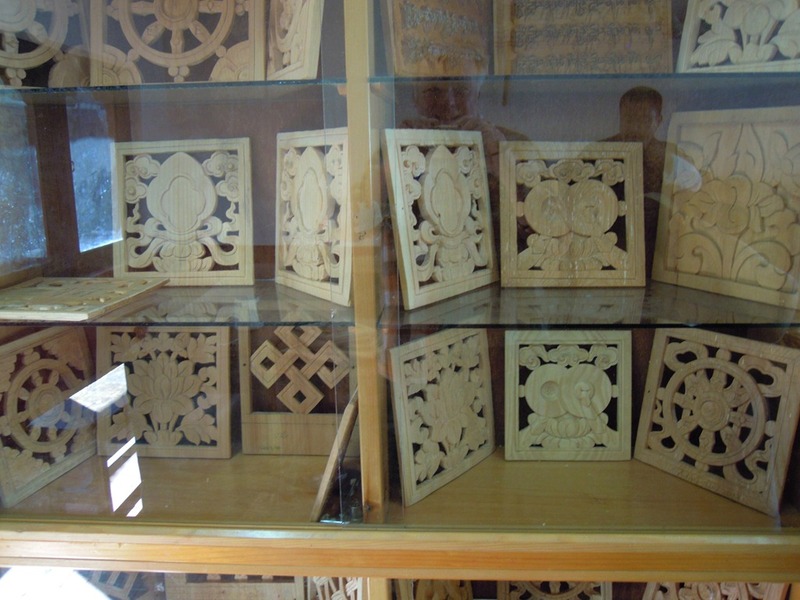 Carved wood blocks are also used for printing religious prayer flags that are seen all over Bhutan in front of monasteries, on hill ridges and other religious places. 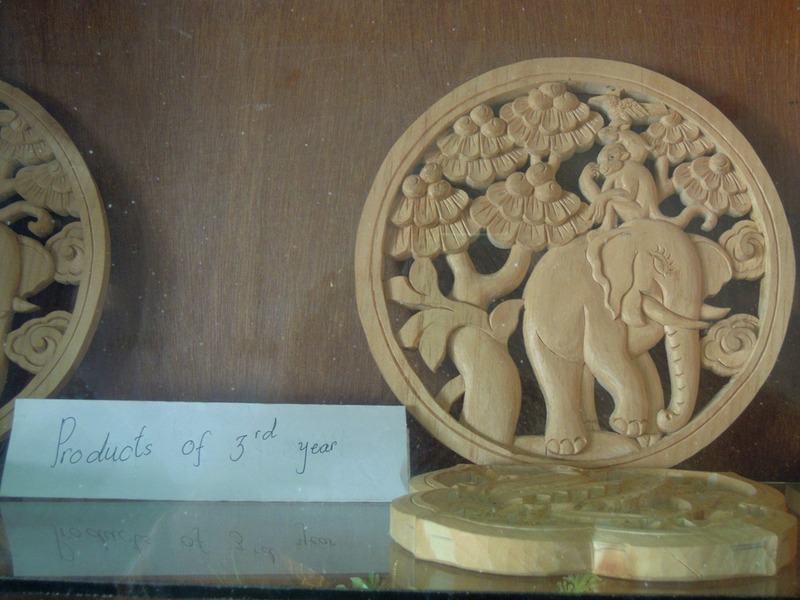 The wood that is used for carving is seasoned for at least one year prior to carving. 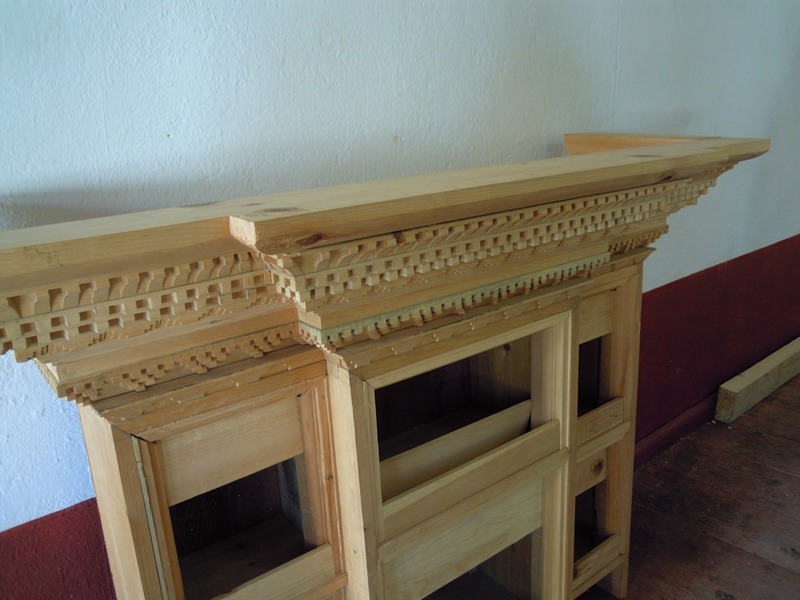 Here is an architectural element. Starting a carving. First it is drilled out, then worked with wood chisels to open up the needed spaces. Some finished pieces (of first year students). Students at work. Note that in this school, all must wear traditional dress. 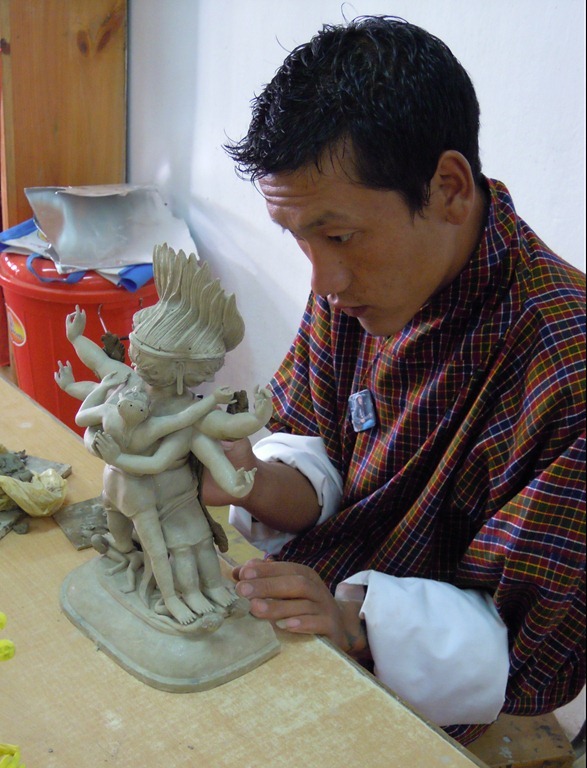 The art of making religious sculptures is unique in Bhutan and very popular in the Himalayan region. 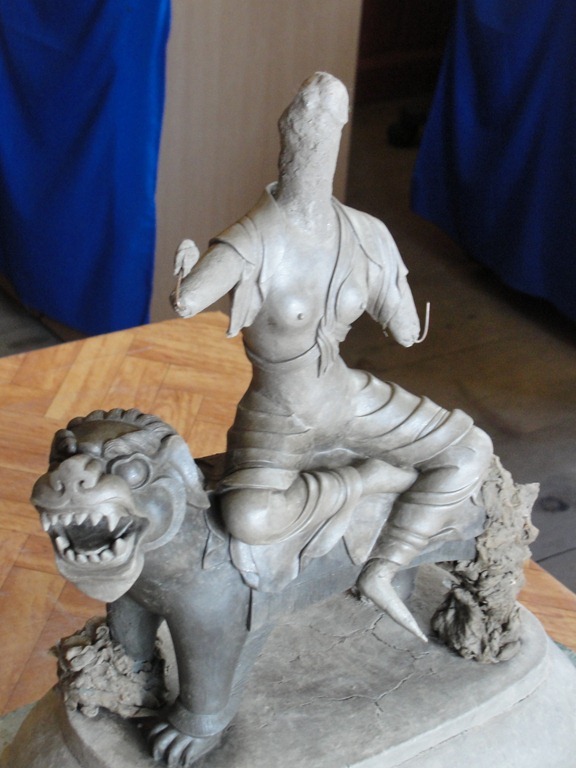 The basic material used for making the sculptures is clay, which is known as jinzob. 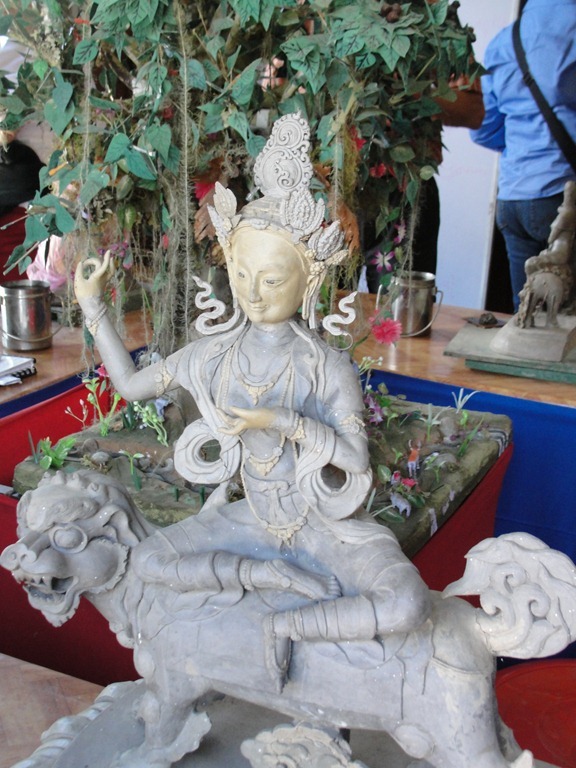 The clay statues of Buddhist religious icons, made by artists of Bhutan, embellish many monasteries in Bhutan. We start with students in a high level, the fifth year. 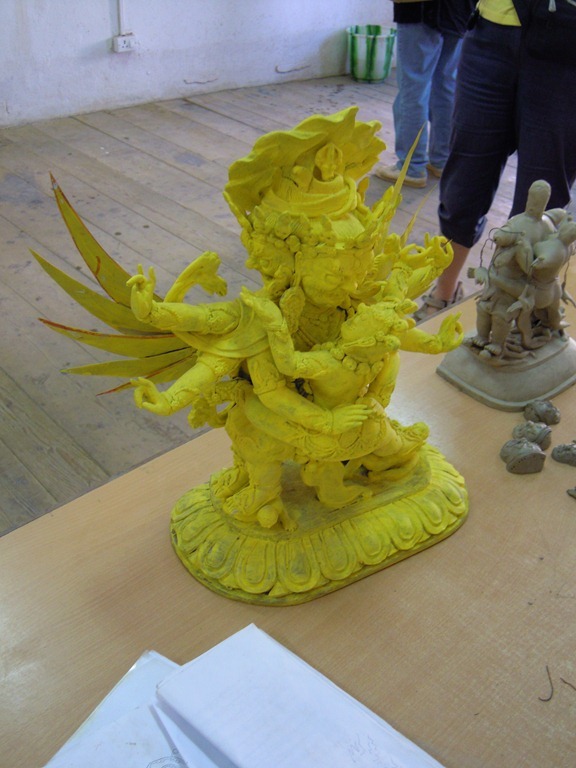 The yellow sculpture is the model. 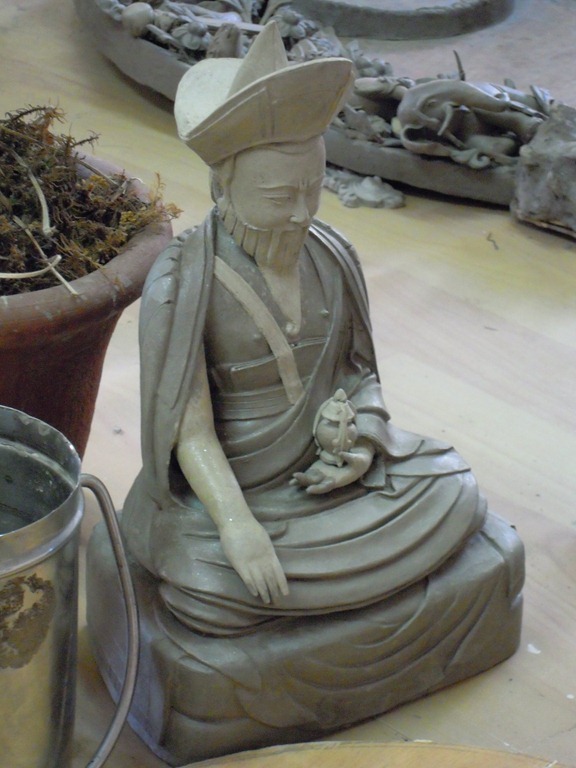 The student works on the grey clay. 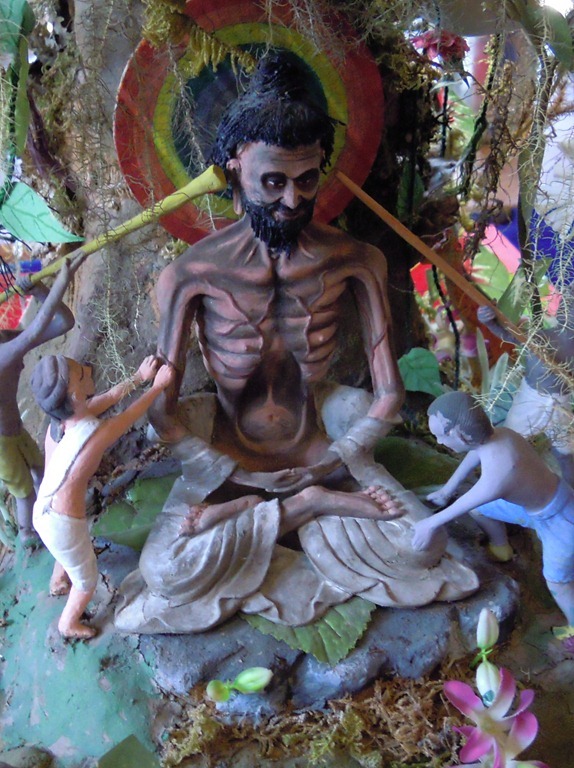 A Buddhist saint, maybe Padma Sambhava? Does anybody know who this is? This is the head, I think, of Tamdrin, a fierce protector god, whom we saw yesterday. Tamdrin, in Yab-yum with his consort. Yab-yum means “Father-mother” and represents the merging of the male and female, understood more deeply as the primordial (or mystical) union of wisdom and compassion. 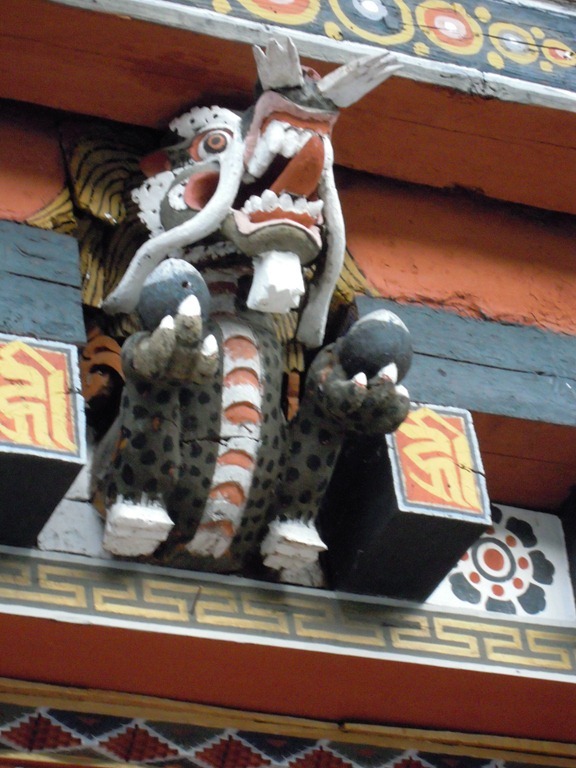 Yab-yum is a common symbol in the Buddhist art of Bhutan (and Tibet). Here is the model the student is working from. 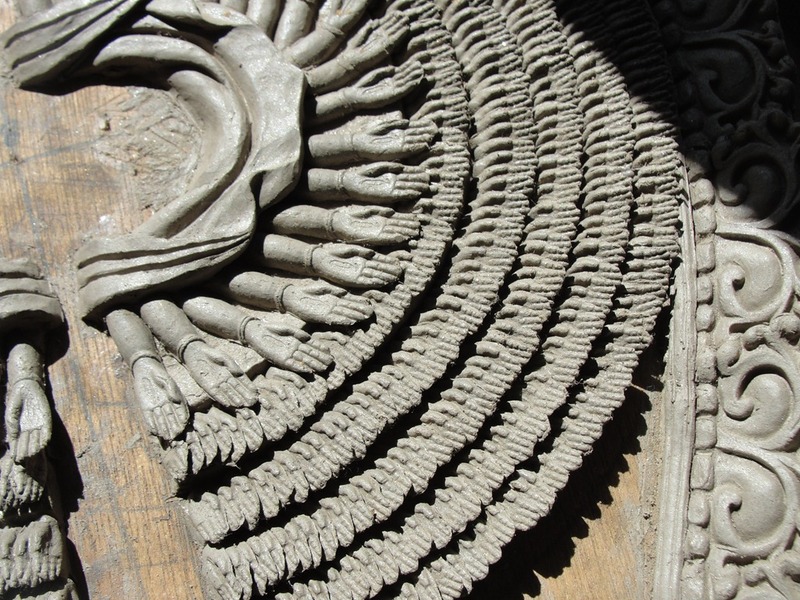 An early stage of the sculpture. 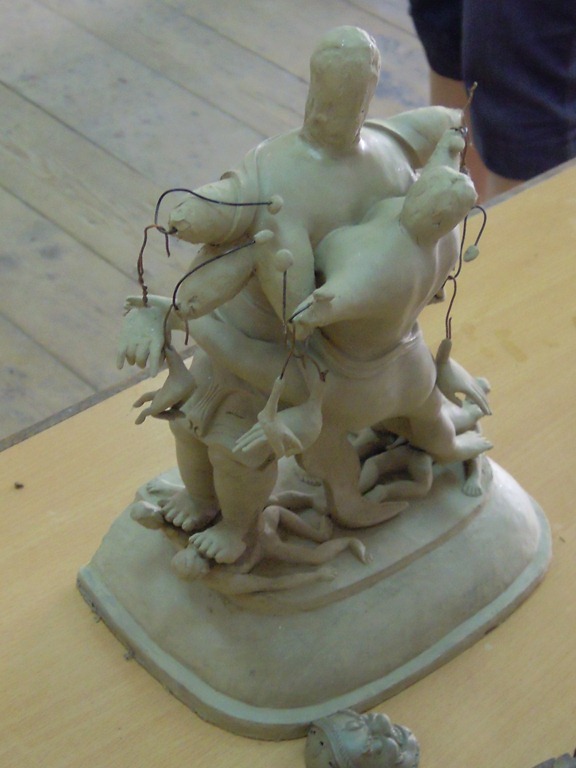 This is, I think, Chenresig: an 11-headed manifestation of Avalokiteśvara, the Bodhisattva of Compassion. 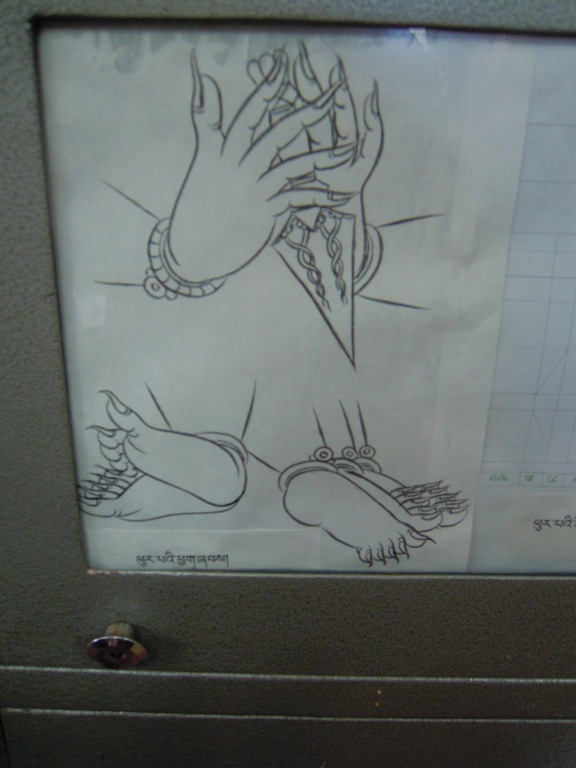 The thousand hands of Chenresig. 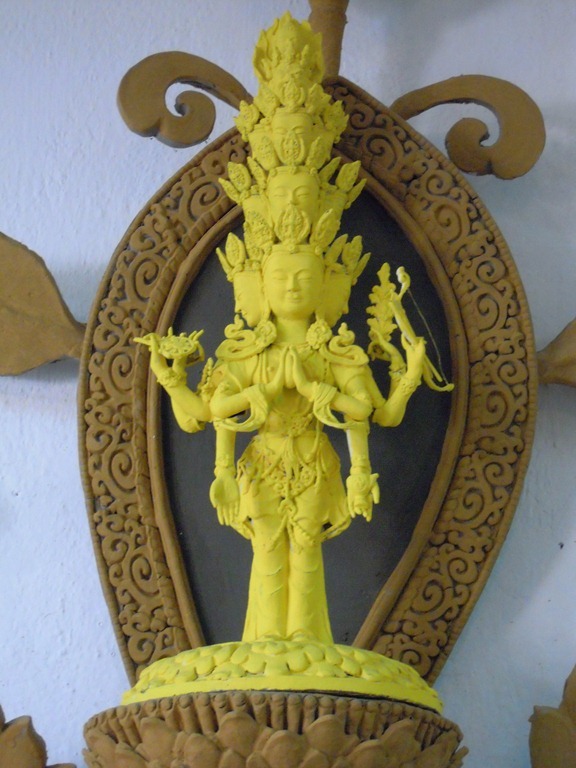 One prominent Buddhist story tells of Avalokiteśvara vowing never to rest until he had freed all sentient beings from samsara. 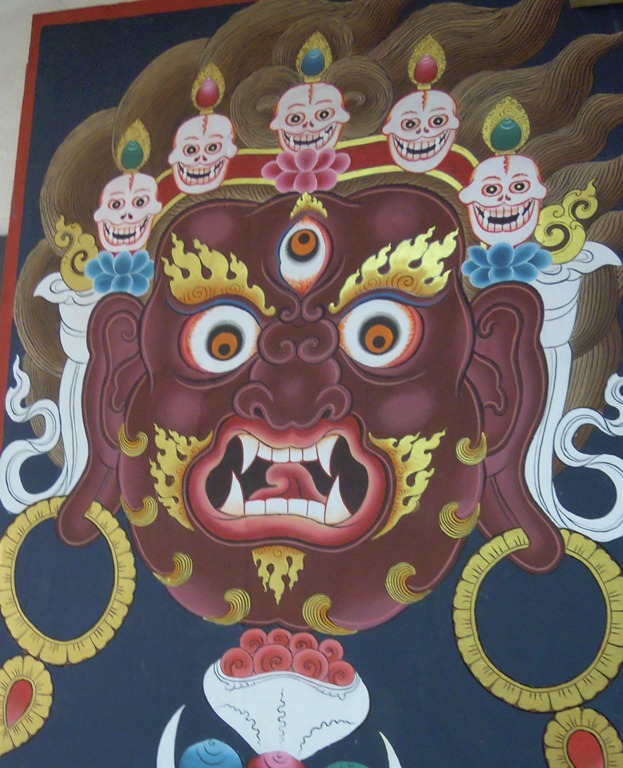 Despite strenuous effort, he realizes that still many unhappy beings were yet to be saved. After struggling to comprehend the needs of so many, his head splits into eleven pieces. 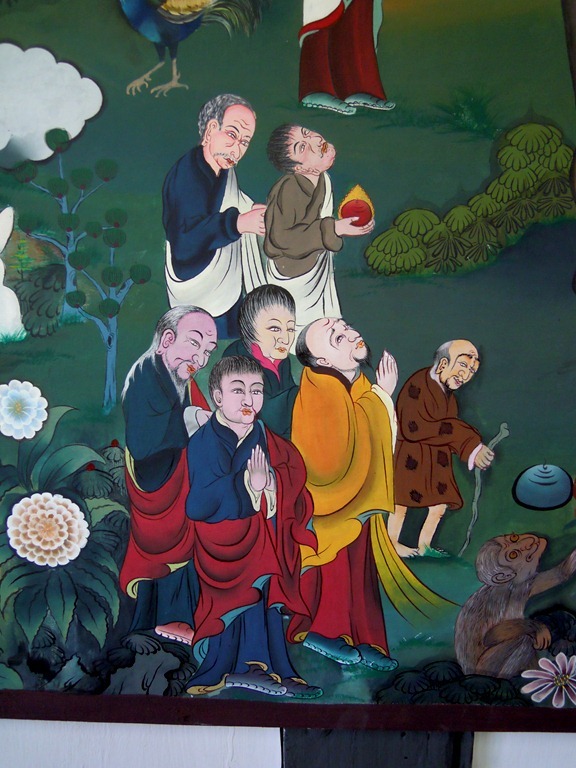 Amitabha Buddha, seeing his plight, gives him eleven heads with which to hear the cries of the suffering. 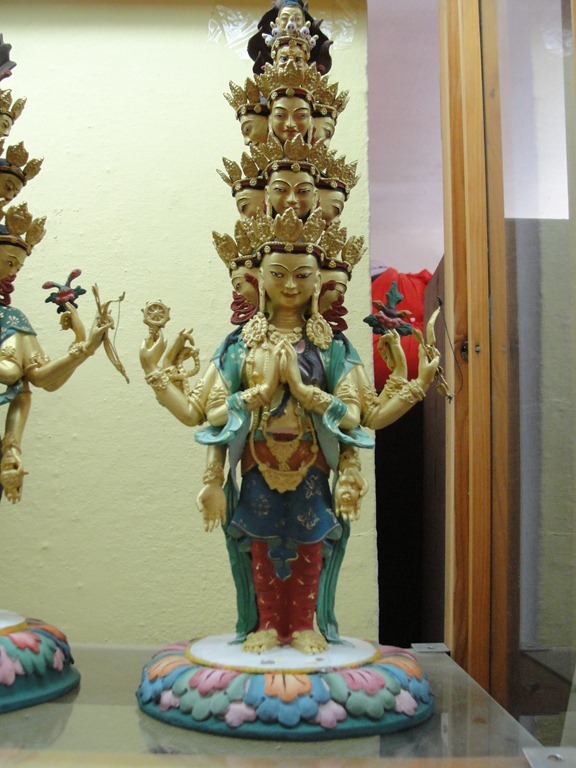 Upon hearing these cries and comprehending them, Avalokiteśvara attempts to reach out to all those who needed aid, but found that his two arms shattered into pieces. 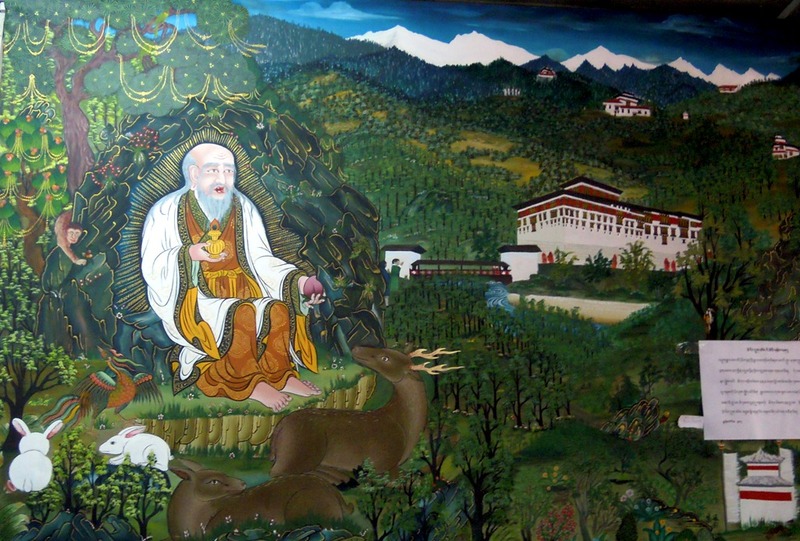 Once more, Amitabha Buddha comes to his aid and invests him with a thousand arms with which to aid the suffering multitudes. 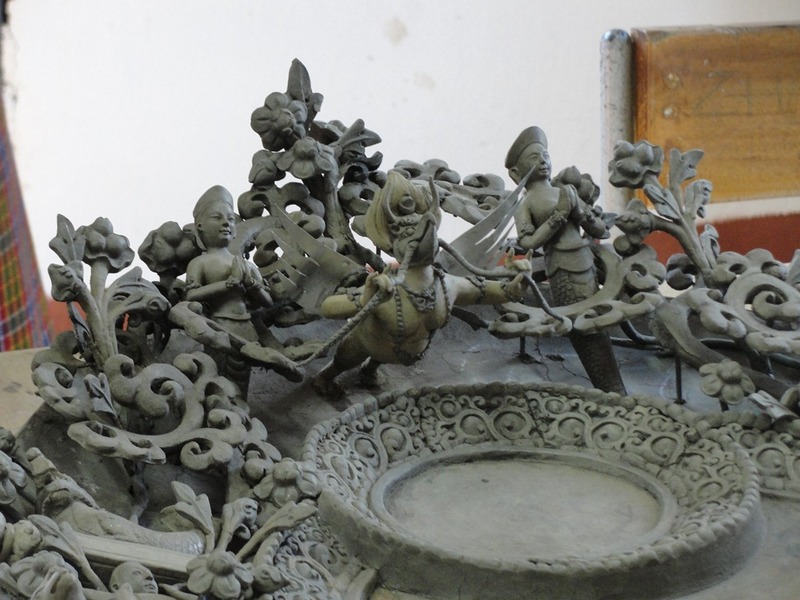 A part of an incomplete sculpture. Incomplete figure. The finished one is below it. I think this is Tara, sitting on a tiger. 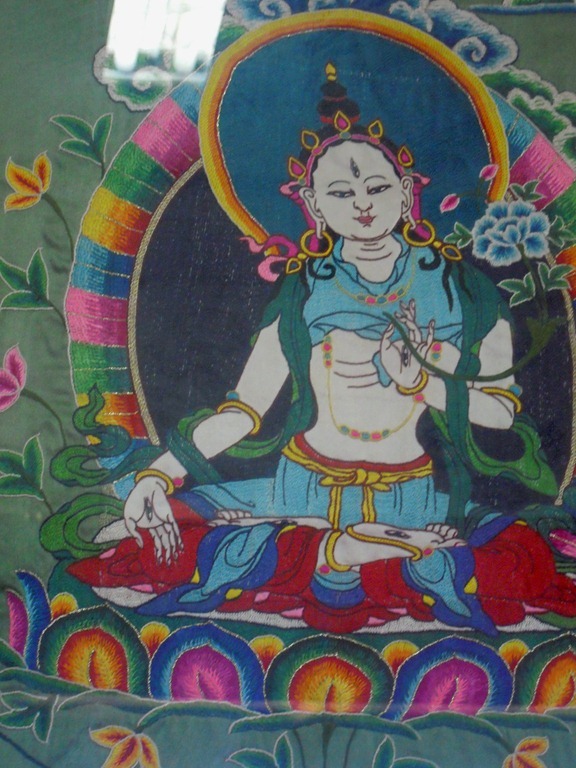 In Tibetan Buddhism Tara is regarded as a Bodhisattva of compassion and action. She is the female aspect of Chenresig, and in some origin stories she comes from his tears. 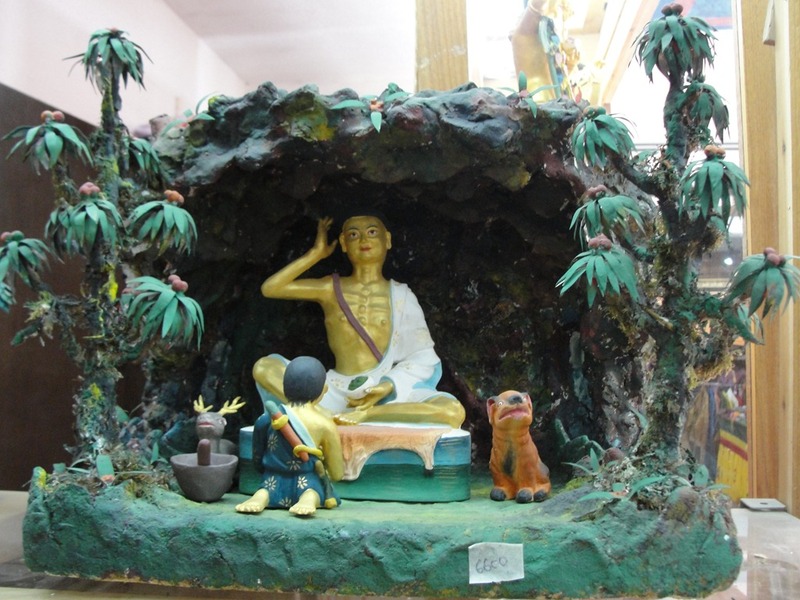 Buddha, meditating under the Bodhi Tree. 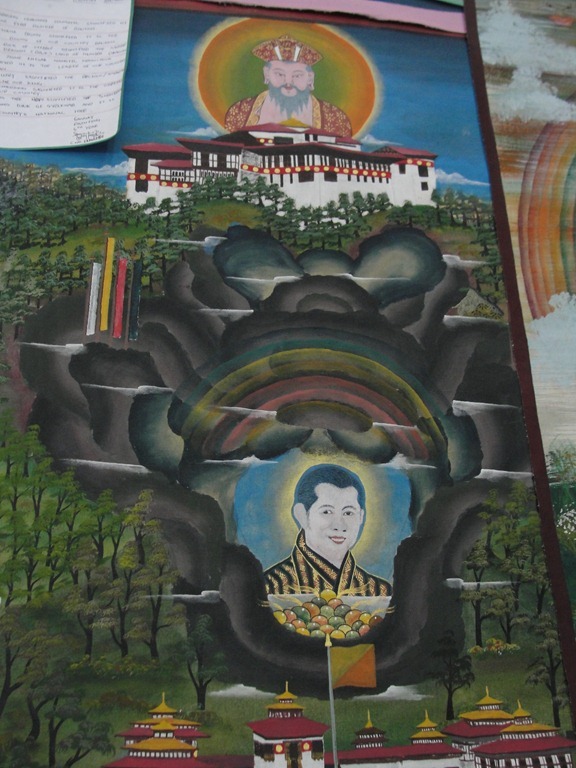 Most Bhutanese art, including painting, lhazo, is invariably religion-centric. These are made by artists without inscribing their names on them. 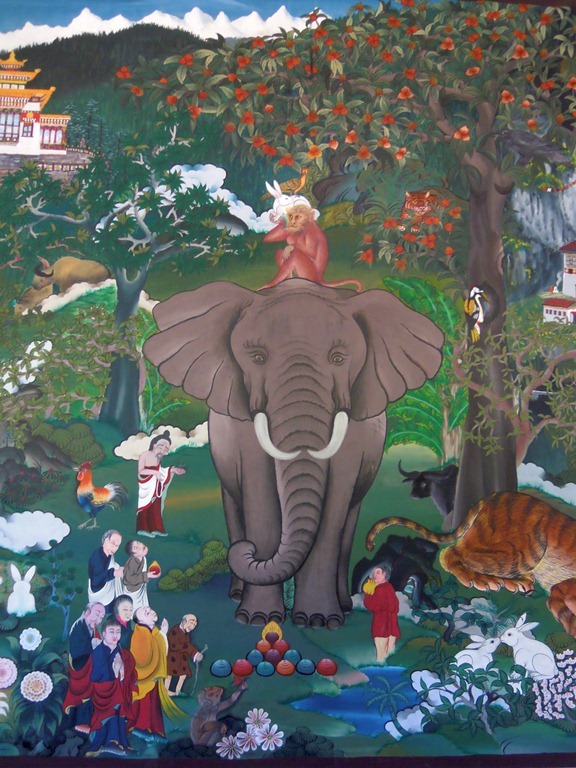 The paintings encompass various types including the traditional thangkas, which are scroll paintings made in highly stylized and strict geometric proportions of Buddhist iconography that are made with mineral paints. To paint, first you must be able to draw. Figures are shown, drawn on a grid. After the drawing comes the painting. First the background is painted. 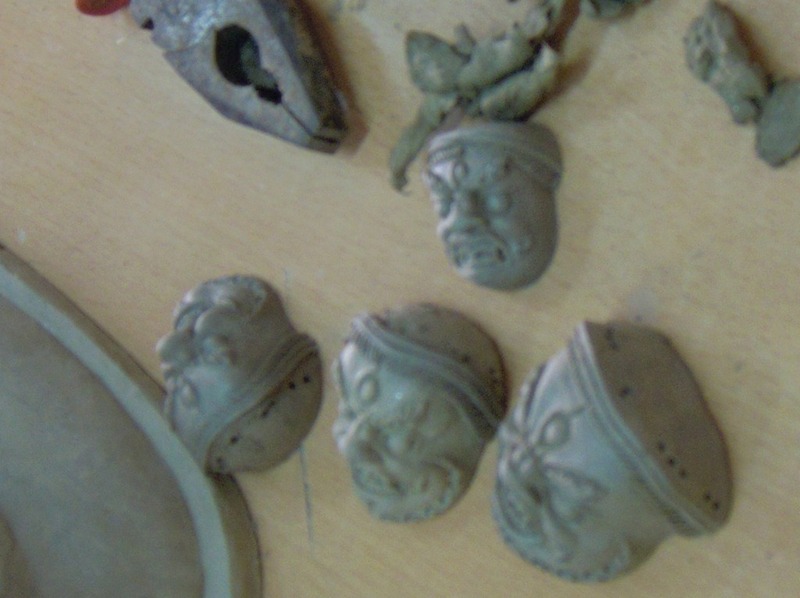 Then the work is done on the central figure. Fine painting on the central figure. 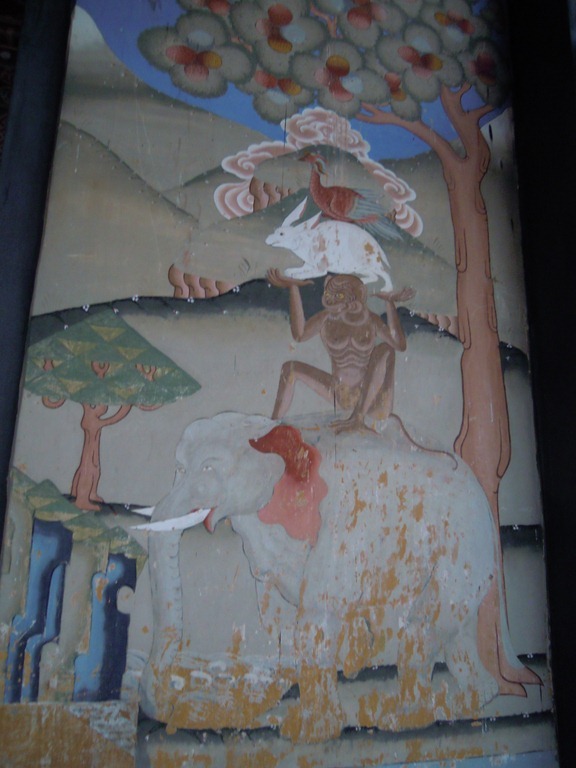 Below, some finished paintings displayed on the walls. 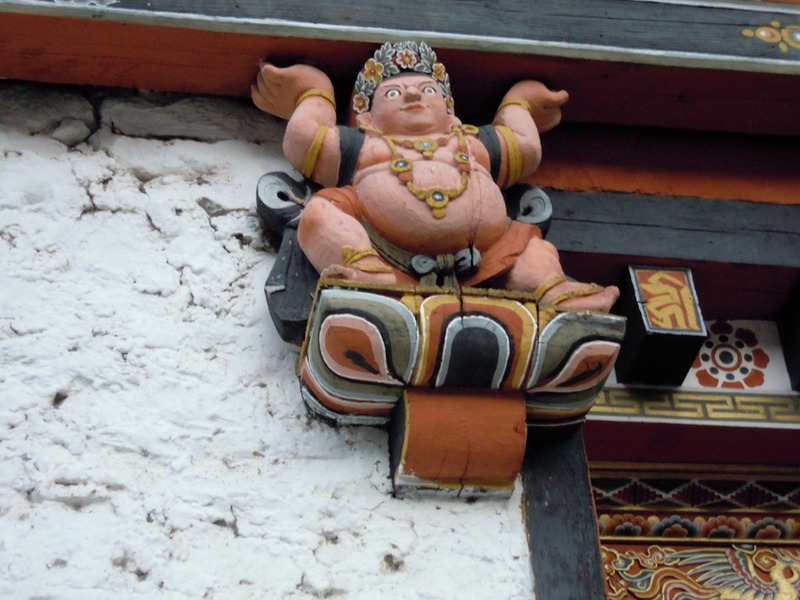 Here is the “Saint Francis”-like character we first saw at, I think, the Rinpung Dzong in Paro. The Four Friends. The bird is often so small you can barely see it. 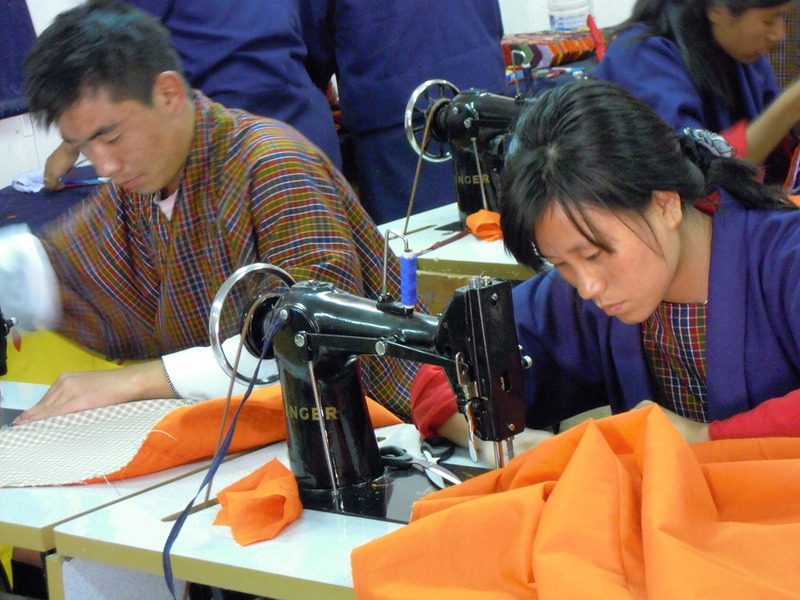 Needlework: Working with needle and thread to make clothes, boots, or the most intricate of appliqué thangkas, is another ancient art form in Bhutan. 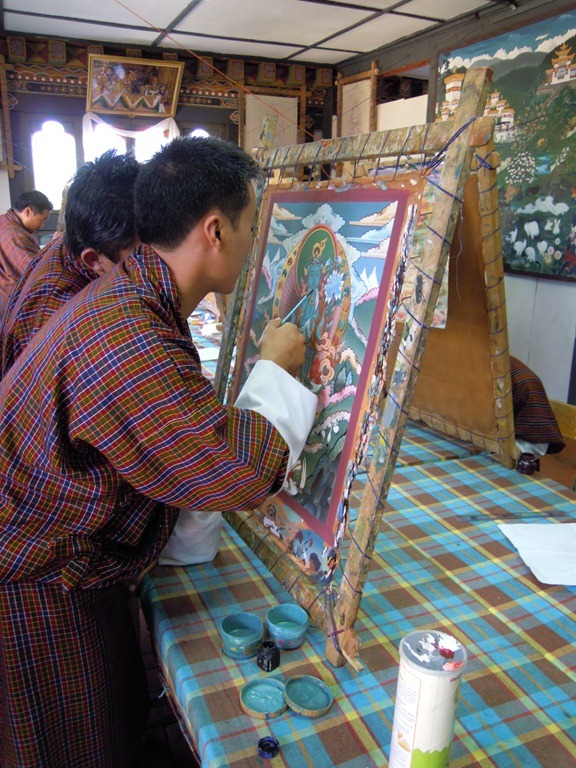 This art form is witnessed all over Bhutan and in the daily life of its people. 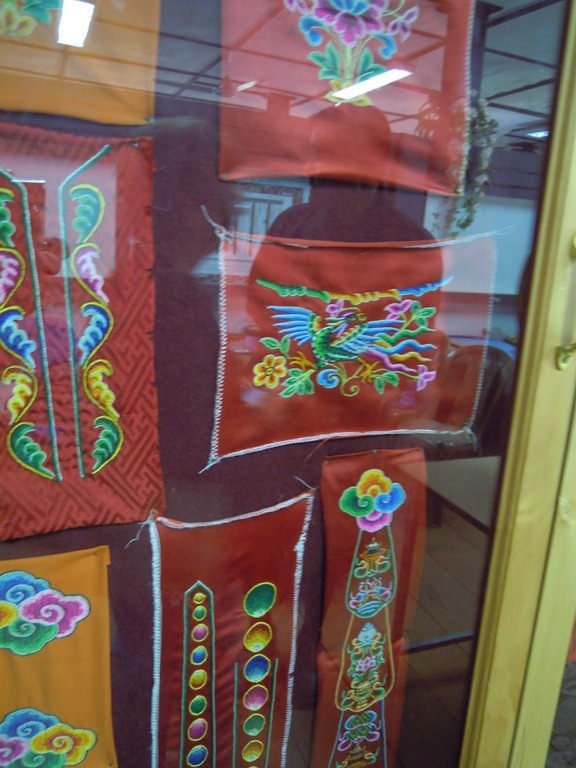 It is also a significant cultural exchange garment that is gifted to mark occasions of birth and death, auspicious functions such as weddings and professional achievements, and in greeting dignitaries. Each region has its own special designs. Some finished items on display. Part of the work is done by machine. Most is done by hand. An instructor gives this girl a critique of her piece. She seems not to be happy about it. 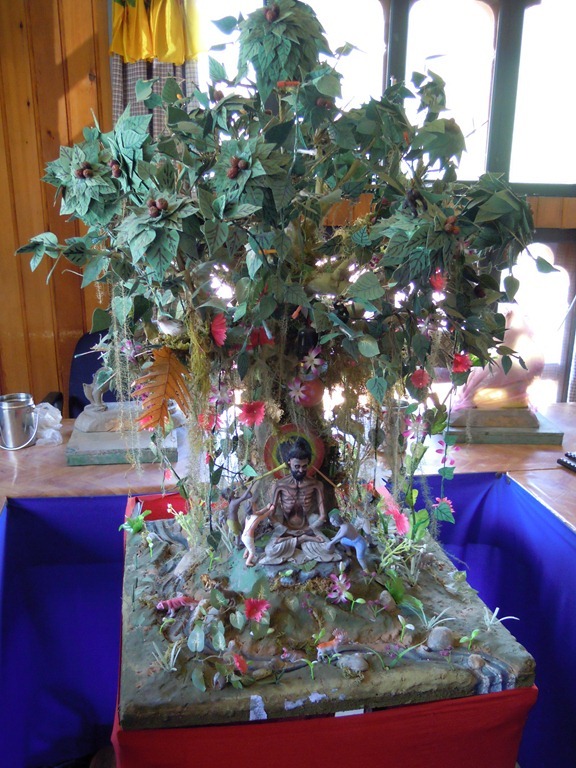 A finished piece, a picture of the Buddha. Below, students visiting from another school. The school store has so many different items available, all student work, all first rate. 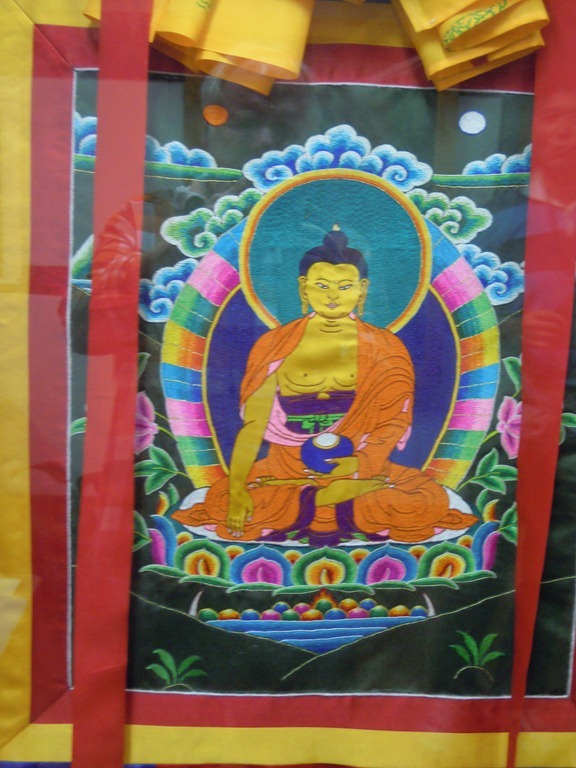 How about an appliqué thangka? 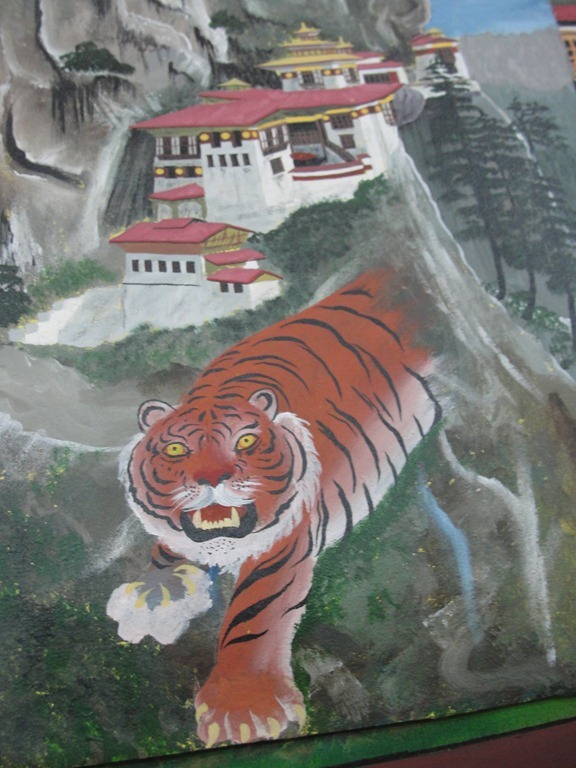 A painting of the Tigers Nest. 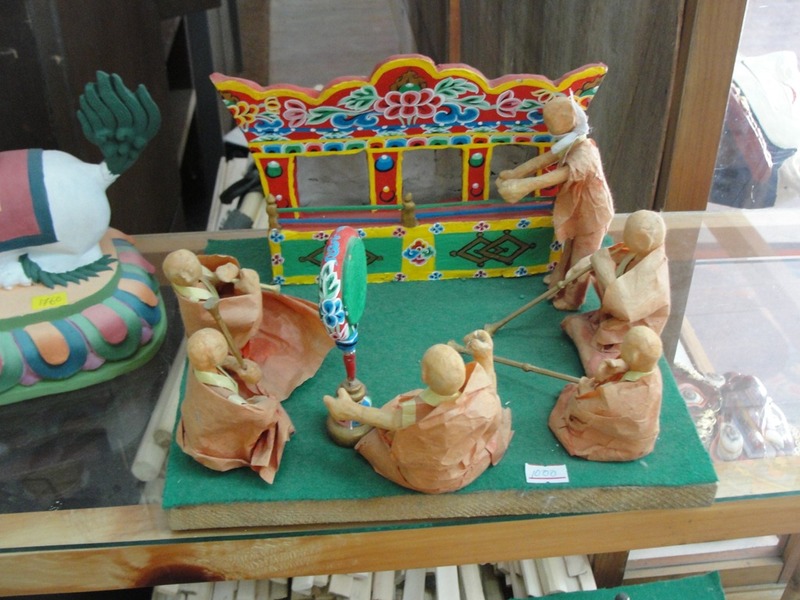 A scene from a temple with musicians drumming and blowing their horns. I think this is a Buddha meditating. 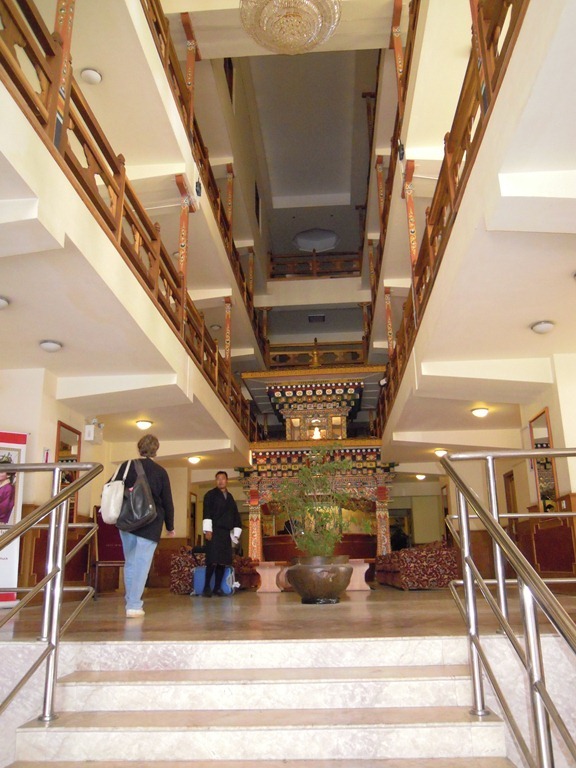 Translated as the “Place of Great Contentment, ” the Hotel Phuntsho Pelri is where we stayed in Thimphu. 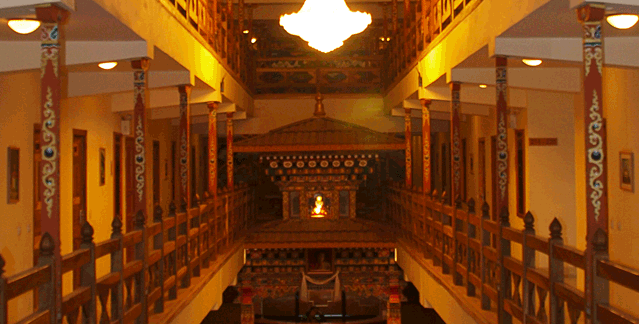 The hotel features classic Bhutanese wooden architecture and design. We had a nice room with handcrafted furniture. This was a pleasant stay. 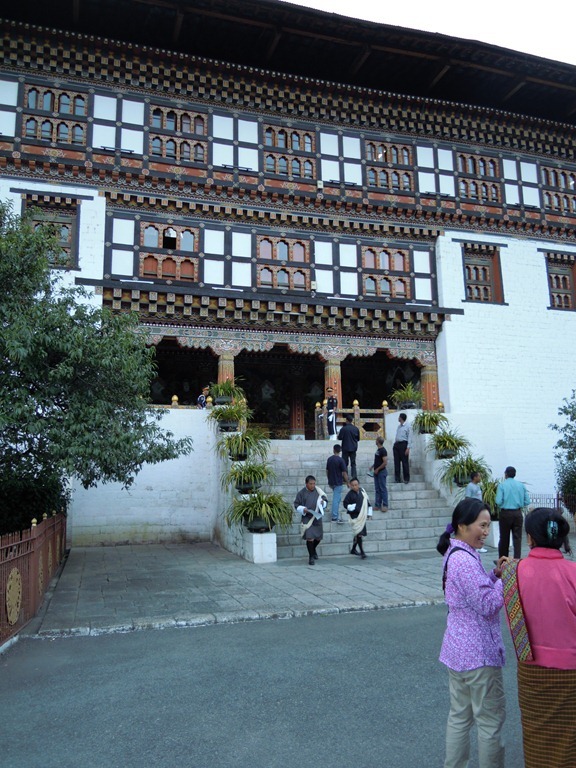 The final part of our day’s adventure was to visit the Tashichhoedzong, which is both a Buddhist monastery and the seat of the country’s government. It is common here that these buildings have both a religious and a secular civil role. 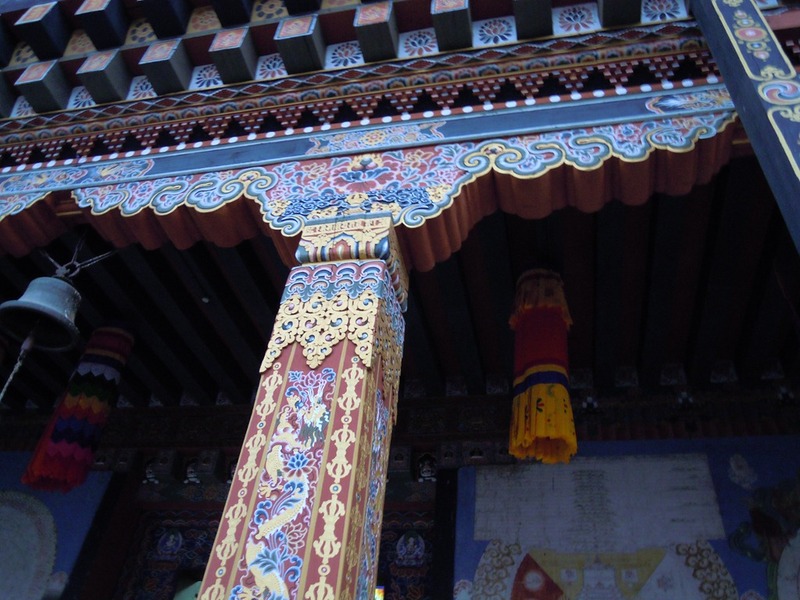 The Tashichhoedzong (also written as Tashichhoe Dzong) is on the northern edge of the city of Thimphu, on the western bank of the Wang Chu river. 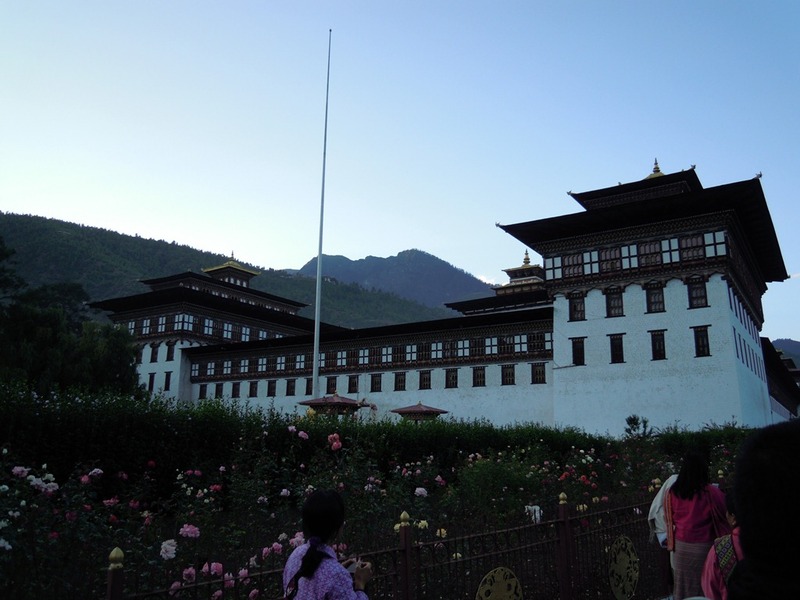 It has traditionally been the seat of the Druk Desi (or "Dharma Raja"), the head of Bhutan’s civil government, an office which has been combined with the kingship since the creation of the monarchy in 1907, and summer capital of the country. 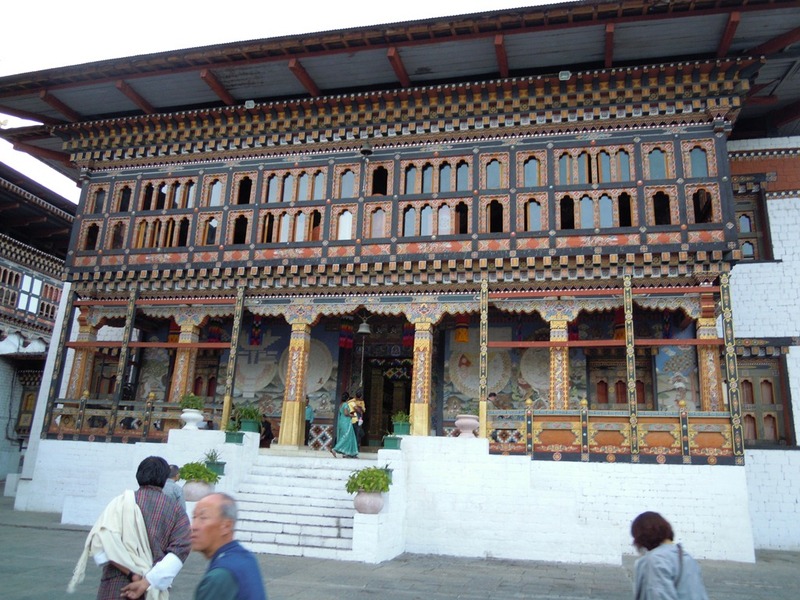 It was built in the mid 1600s by the first Dharma Raja, Phuntsog Namgyal of the Namgyal Monarchy (also called the Chogyal Monarchy), who also founded the Lho-drukpa sect of Buddhism, which has remained the distinctive sect of Bhutan. 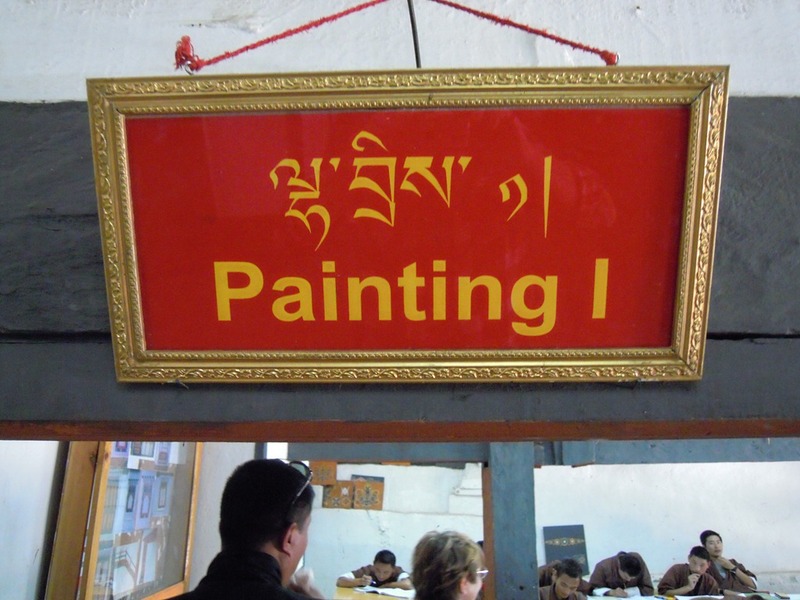 The correct transliteration of the vernacular name—Bkrashis-chhos-rdzong, means "the fortress of auspicious doctrine"—according to Dr. Graham Sandberg. We arrive near the end of the day. The light is failing already. Below is our guide, Lhendup, with two women, who I think may also be guides. All are in traditional dress. For me, photography is not just a profession but also a lifelong passion. When I first saw a camera as a little boy, it instantly captured my imagination. Since that day, I have loved the art of photography and the creative process it entails. It was therefore only a natural progression that I would later decide to take up photography as a fulltime career. And I am glad that I made that decision. 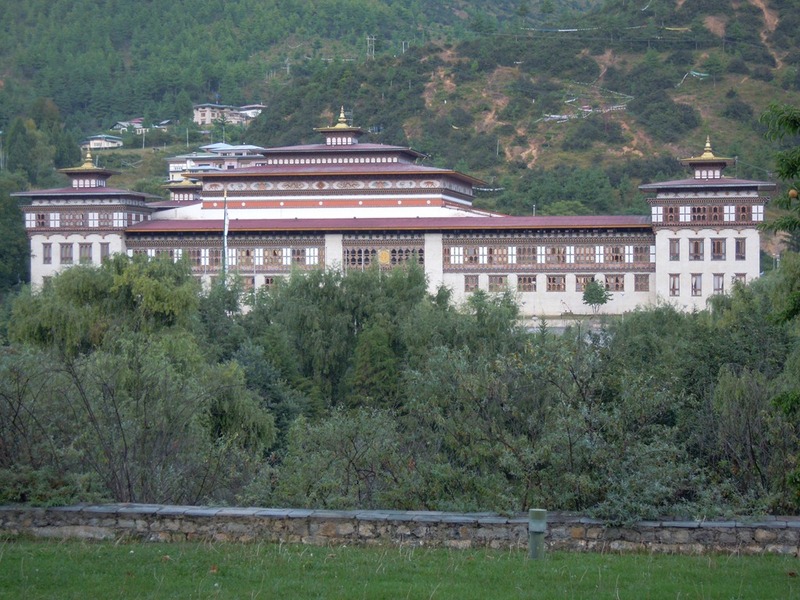 A better view of the Tashichhoedzong. The main structure of the whitewashed building is two-storied with three-storied towers at each of the four corners, topped by triple-tiered golden roofs. There is also a large central tower or utse. 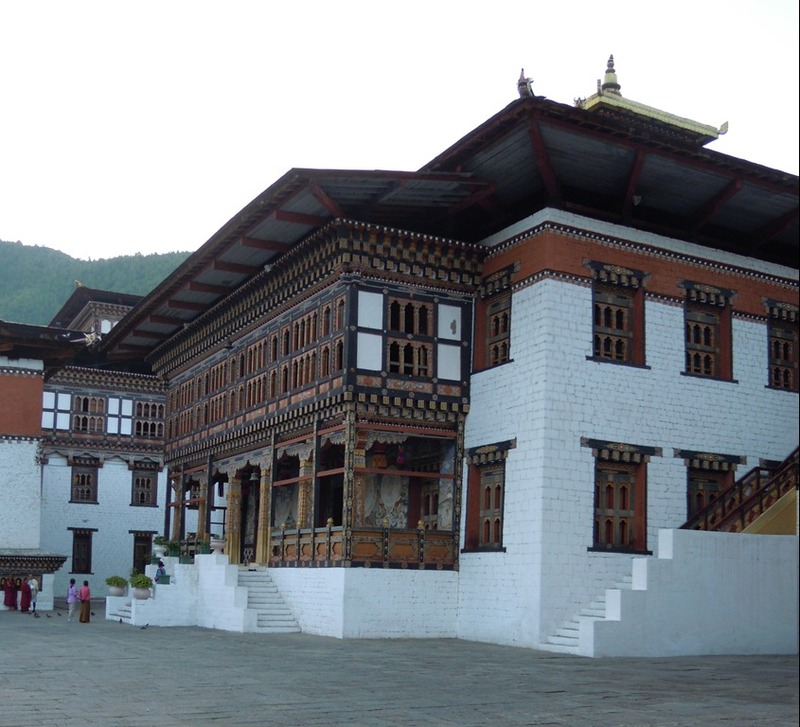 The original Thimphu dzong (the Dho-Ngyen Dzong, or “Blue Stone Dzong”) was built in 1216 by Lama Gyalwa Lhanangpa. It has been expanded and relocated to its present location in the ensuing centuries. 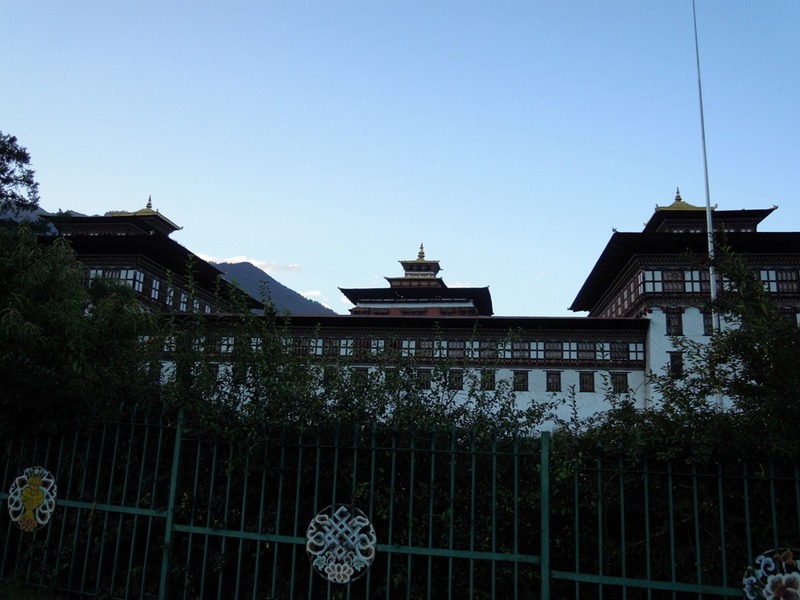 It has been the seat of Bhutan’s government since 1952 and presently houses the throne room and offices of the King, the secretariat, and the ministries of home affairs and finance. 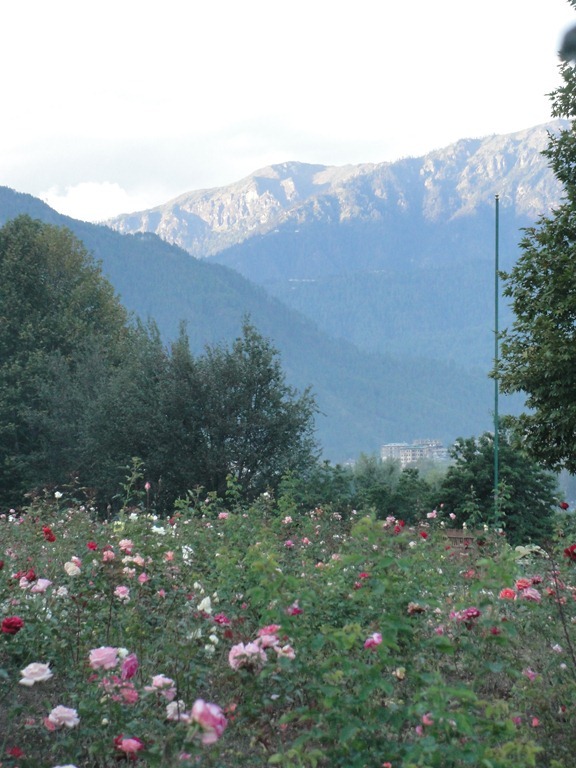 Mountains surrounding the Thimphu valley. A guard at the entrance. Notice the elaborately decorated pillar. We are inside now and see the central tower, utse. The traditional tiered roof with its central spire. The corners are adorned with animals. I think this is a protective bird. More figures decorating the upper section of the walls. 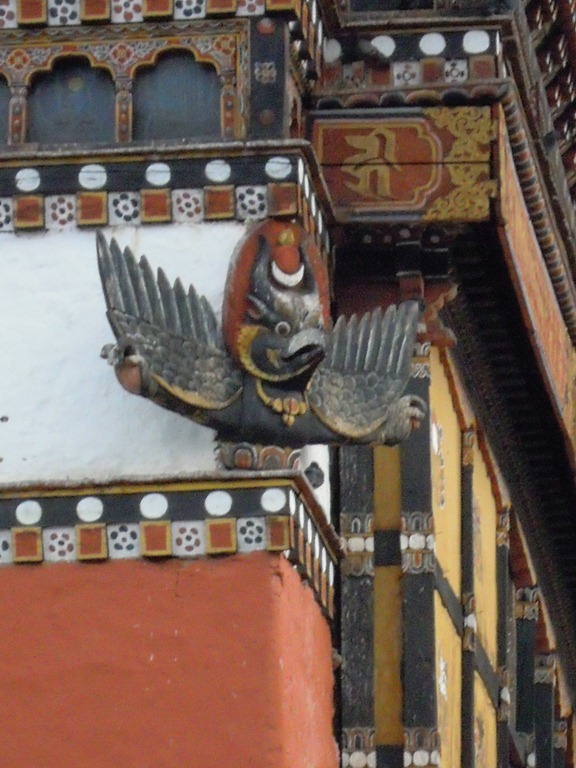 A close-up of one of them, holding up the wall. A monk, gazing out a window. More animals line the roof of the utse. As we leave, we see yet another painting of the Four Friends. This is one of the most common images that we saw in the country. Here is another shot of the fancy pillars in the entrance. 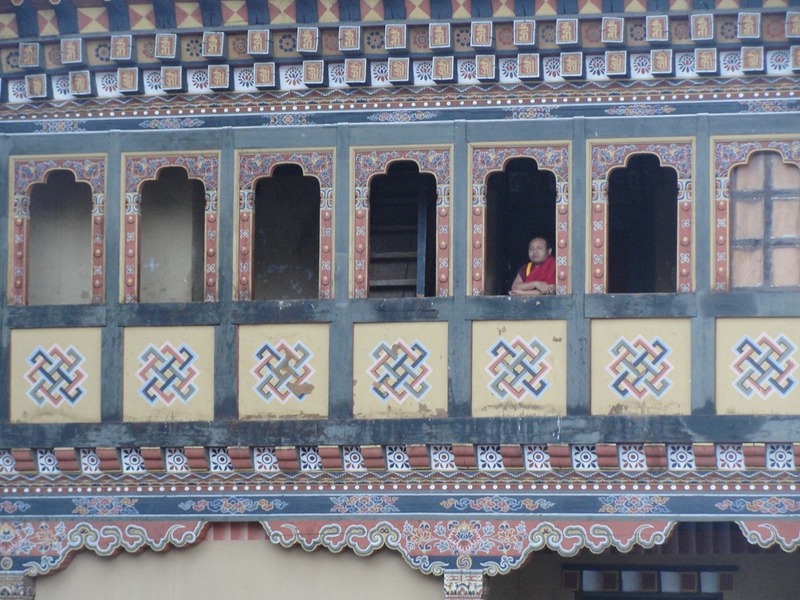 Another day in Bhutan. 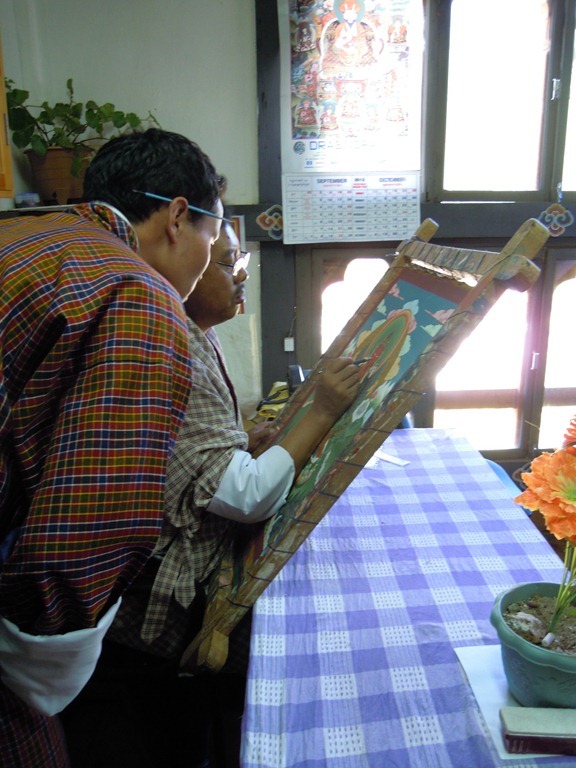 I was very interested to see the focus on preservation of the traditional arts. 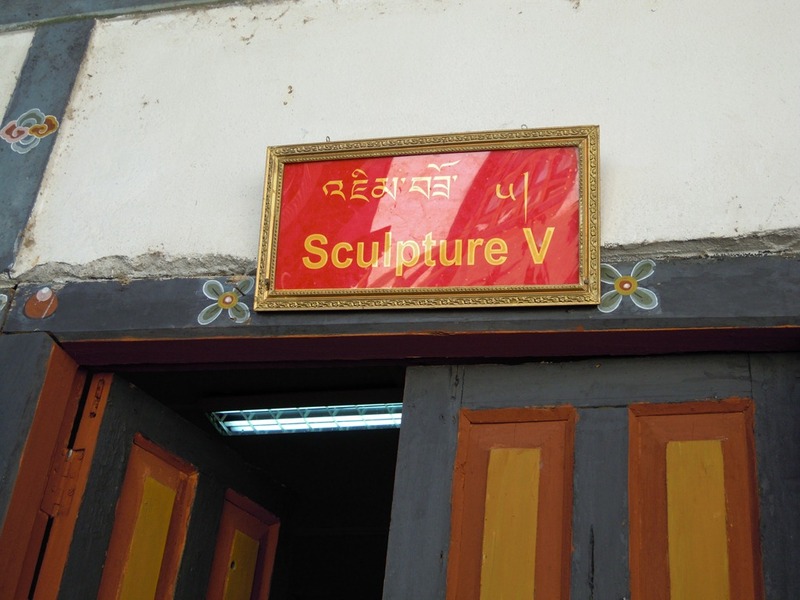 I guess this is just one item in the desire of the King to preserve Bhutan. I think this is precious for the world; most places I know that receive tourists have been pretty overwhelmed and changed by this. 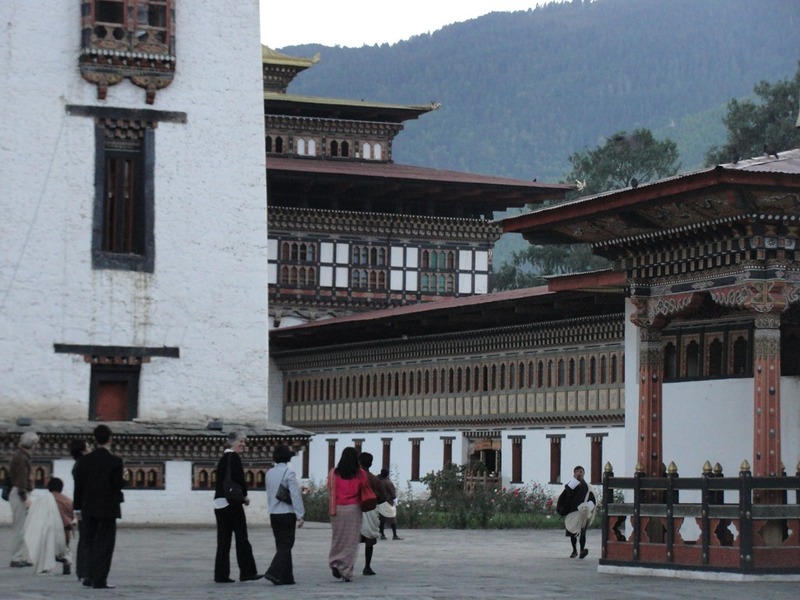 Bhutan is trying to keep its own essence. Good job, Dragon King Jigme Khesar Namgyel Wangchuck! Touring and Travel in India Our travels within India. Touring and Travel outside India Our travels outside India. This entry was posted on October 3, 2013 at 1:41 pm and is filed under art, Travel outside India. You can follow any responses to this entry through the RSS 2.0 feed. You can leave a response, or trackback from your own site.